A biodegradable, substantially continuous filament is provided. The filament contains a first component formed from at least one high melting polyester and a second component formed from at least one low melting polyester. The low melting point polyester is an aliphatic-aromatic copolyester formed by melt blending a polymer and an alcohol to initiate an alcoholysis reaction that results in a copolyester having one or more hydroxyalkyl or alkyl terminal groups. By selectively controlling the alcoholysis conditions (e.g., alcohol and copolymer concentrations, catalysts, temperature, etc. ), a modified aliphatic-aromatic copolyester may be achieved that has a molecular weight lower than the starting aliphatic-aromatic polymer. Such lower molecular weight polymers also have the combination of a higher melt flow index and lower apparent viscosity, which is useful in the formation of substantially continuous filaments. 生物可降解无纺纤网在多种应用中都有用，如一次性吸收产品（如尿布，训练裤，卫生擦拭品，女用护垫及衬垫，成人失禁护垫，护罩，服装等）和/或健康护理产品（如外科手术服，遮盖品等）的制造中。  The biodegradable nonwoven webs are useful in various applications, such as disposable absorbent products (e.g., diapers, training pants, sanitary wipes, feminine pantiliners and pads, adult incontinence pads, shields, clothing, etc.) and / or health care products (such as surgical gowns, covering goods, etc.) in manufacturing. 为了便于制造无纺纤网，需选用可熔融处理、同时也具有良好机械及物理性能的生物可降解聚合物。 For ease of manufacture nonwoven web, the need to use a melt process, while also having good mechanical and physical properties of the biodegradable polymer. 已开发出具有良好机械及物理性能的生物可降解的脂肪族-芳香族共聚多酯。 Organisms have been developed having good mechanical and physical properties of the degradable aliphatic - aromatic copolyester. 不幸的是，脂肪族-芳香族共聚多酯的高分子量及高粘度通常阻碍了其在特定纤维制造方法中的应用。 Unfortunately, aliphatic - aromatic copolyester of high molecular weight and high viscosity often prevents its application in the manufacturing method of the particular fiber. 例如，常规的脂肪族-芳香族共聚多酯一般不适合熔喷方法，在该方法中要求低聚合物粘度以成功的形成微纤维。 For example, conventional aliphatic - aromatic copolyester meltblown process is generally not suitable, low polymer viscosity requirement in the process to successfully form microfibers. 因为如此，目前存在需要一种可显示出良好机械和物理性能的生物可降解脂肪族-芳香族共聚多酯的需求，而同时其可以容易地采用多种方法（例如，熔喷）制成无纺纤网。 Because of this, there exists a need for an exhibit good mechanical and physical properties of the biodegradable aliphatic - aromatic copolyesters demand, while it can easily use a variety of methods (e.g., meltblown) made non- spinning webs. 按照本发明的一个实施方案，公开了一种生物可降解的、基本上连续的多组分纤丝，该纤丝含有第一组分及第二组分。  According to an embodiment of the present invention, discloses a biodegradable, substantially continuous multicomponent filaments, the filaments comprising a first component and a second component. 所述第一组分含有熔点为约150°C到约250°C的第一种聚酯，所述第二组分含有第二种聚酯。 Said first component having a melting point of approximately 150 ° C to about the first polyester to 250 ° C, said second component comprising a second polyester. 第二种聚酯为以烷基、羟烷基或其组合封端的脂肪族-芳香族共聚多酯。 The second polyester is an alkyl, hydroxyalkyl, or combinations thereof terminated aliphatic - aromatic copolyester. 所述脂肪族-芳香族共聚多酯具有按照ASTM试验方法D1238-E、在负载为2160克及温度为190°C下测定的，约5到约200克每10分钟的熔体流动指数。 The aliphatic - aromatic copolyester having in accordance with ASTM Test Method D1238-E, a load of 2160 g and a temperature of 190 ° C measured at, from about 5 to about 200 grams per 10 minutes melt flow index. 按照本发明的另一实施方案，公开了生物可降解、基本上连续的多组分纤丝的形成方法。  According to another embodiment of the present invention, discloses a biodegradable, substantially continuous method for forming the multicomponent filaments. 所述方法包括形成含有熔点为约150°C到约250°C的第一种聚酯的第一热塑性组合物，以及将前体脂肪族-芳香族共聚多酯与至少一种醇熔体混合，以使该共聚多酯发生醇解反应以形成第二种热塑性组合物。 The method comprises forming a first polyester having a melting point of approximately 150 ° C to 250 ° C to about the first thermoplastic composition, and the precursor is an aliphatic - aromatic copolyester with at least one alcohol melt mixing to make the copolyester alcoholysis reaction occurs to form a second thermoplastic composition. 所述醇解反应生成熔体流动指数大于前体共聚多酯的熔体流动指数的改性共聚多酯，所述熔体流动指数按照ASTM测试方法D1238-E、在负载为2160克，温度为190°C下测定。 The alcoholysis reaction melt flow index greater than the copolyester melt flow index of the modified copolyester precursor, the melt flow index according to ASTM Test Method D1238-E, a load of 2160 g, temperature measured at 190 ° C. 共挤出第一种热塑性组合物及第二种热塑性组合物以生成基本上连续的纤丝。 Co-extruding the first thermoplastic composition and the second thermoplastic composition to form substantially continuous filaments. 本发明的其他特征和方面在下文中更详细的讨论。  A more detailed discussion of the features and other aspects of the invention hereinafter. 图4为描述了实施例4的挤出树脂的表观粘度对不同剪切速率的图。  FIG. 4 is a resin was extruded described embodiments apparent viscosity versus shear rate of 4 different. 在本说明书及附图中重复使用的参考标志意图表示本发明中相同或相似的特征或元素。  Reference signs are intended to be reused in the present specification and drawings represents the same or analogous features or elements of the present invention. 现将引用本发明不同实施方案的详细说明，下文列出了一个或多个实例。  Reference will now be described in detail various embodiments of the present invention, are listed below one or more examples. 每个实例旨在解释本发明，而非对本发明进行限制。 Each example is intended to explain the invention, not to limit the present invention. 实际上，对本领域技术人员而言，明显可以在不背离本发明的范围或精神的前提下进行各种修改或变化。 In fact, to those skilled in the art, it may be apparent that various modifications or variations without departing from the scope or spirit of the present invention is provided. 例如，作为一个实施方案的一部分而被说明或描述的特征可用于另一实施方案中，以产生再一个实施方案。 For example, as part of one embodiment is illustrated or described features may be used on another embodiment to yield a still further embodiment. 因此，本发明期望涵盖所附权利要求及其等同体的此类修改及变化。 Accordingly, the present invention is intended to cover such modifications in the appended claims and their equivalents and variations thereof. 本文所使用的术语“生物可降解的”或“生物可降解的聚合物” 一般指在自然存在的微生物如细菌，真菌及藻类；环境热量；水汽；或其他环境因素的作用下降解的材料。  As used herein, the term "biodegradable" or "biodegradable polymer" refers generally to naturally occurring microorganisms such as bacteria, fungi and algae; environmental heat; moisture; effects or other environmental factors degrade s material. 材料的生物可降解性可利用ASTM测试方法5338. 92测定。 The biological material may be biodegradable 5338.92 measured using ASTM test methods. 本文所使用的术语“连续纤丝纤网”一般指含有基本上连续的纤丝的无纺纤网。 The term  As used herein, "continuous filaments web" generally refers to a nonwoven web containing substantially continuous filaments. 所述纤丝可能，例如具有远大于其直径的长度，例如长度和直径的比例（长宽比）大于15,000 ： I，在一些情况下，大于50，000 ： I。 The filaments may, for example, having a length much greater than its diameter, for example, the ratio of length and diameter (aspect ratio) is greater than 15,000: I, in some cases, greater than 50,000: I. 本文所使用的术语“无纺纤网”指具有独立线（例如，纤维或纤丝）结构的纤网，所述线随机夹层分布，而非如编织织物以可确认的方式分布。  As used herein, the term "nonwoven web" means a web having separate lines (e.g., fibers or filaments) structure, a random distribution of the interlayers of the line, such as a woven fabric not in an identifiable manner distributed. 无纺纤网包括，例如熔喷纤网，纺粘纤网，梳理纤网，湿法纤网，气流法纤网，共成型纤网，水刺纤网等。 Nonwoven webs include, for example, meltblown webs, spunbond webs, carded webs, wet-laid webs, airlaid webs, coform webs, hydroentangled webs and the like. 无纺纤网的基重一般可变化，但典型地为约5克每平方米（“gsm”）到200gsm，在一些实施方案中为约IOgsm到约150gsm,在一些实施方案中为约15gsm到约lOOgsm。 The basis weight of nonwoven web generally vary, but is typically from about 5 grams per square meter ( "gsm") to 200 gsm, in some embodiments, from about IOgsm to about 150 gsm, in some embodiments, from about 15gsm to about lOOgsm. 本文所使用的术语“熔喷纤网”一般指通过将熔化的热塑性材料由多个细微的、通常是圆形的毛细模头中，作为熔融纤维挤出进入到会聚的高速气流（如空气）中的方法而制备的纤网，该气流将熔化的热塑性材料的纤维变细以减小其直径，所述直径可被减至微纤维直径的水平。  As used herein, the term "meltblown web" generally refers to the molten thermoplastic material through a plurality of fine, usually circular, die capillaries as molten fibers extruded into converging high velocity gas ( as the web) in the process for preparing the air, the gas stream will attenuate the fibers of molten thermoplastic material to reduce their diameter, which may be reduced to the level of microfiber diameter. 此后，熔喷纤维通过高速气流运输并堆积收集面上，以形成随机分布熔喷纤维的纤网。 Thereafter, the meltblown fibers transported by high velocity gas stream and deposited on a collecting surface to form a web of randomly distributed meltblown fibers. 这种方法公开于，如Butin等的美国专利No. 3，849，241，在此出于所有目的将其全文引入作为参考。 This method is disclosed in, e.g. Butin et U.S. Patent No. 3,849,241, herein for all purposes by reference in its entirety herein. 一般来讲，熔喷纤维可能是基本上连续或非连续的微纤维，其直径通常小于10微米，并当堆积到收集面上时通常是粘的。 Generally speaking, meltblown fibers may be substantially continuous or discontinuous microfibers having a diameter generally less than 10 microns and, when deposited into a collecting surface is usually tacky. 本文中所使用的术语“纺粘纤网”通常指含有小直径的基本上连续的纤丝的纤网。 The term  As used herein, "spunbond web" generally refers to a substantially continuous filaments of a web containing small diameter. 所述纤丝通过将融化的热塑性材料从多个细微的、通常是圆形的毛细喷丝头中挤出成细纤丝，随后迅速减少被挤出纤丝的直径,例如通过离析拔丝（eductive drawing)和/或其他公知纺粘机理而形成。 The filaments by the melted thermoplastic material from a plurality of fine, usually circular spinneret capillary extruded into fine filaments, then diameter of the extruded filaments is rapidly reduced, for example by isolating Roberts (eductive Drawing) and / or other well known spunbonding mechanisms is formed. 纺粘纤网的牛产描沭并说明于，如AdDeI等的美国专利No. 4, 340, 563, Dorschner等的美国专利No. 3, 692, 618, Matsuki等的美国专利No. 3，802, 817，Kinney 的美国专利No. 3，338，992 及Kinney 的美国专利No. 3，341，394，Hartman的美国专利No. 3，502, 763，Levy等的美国专利3，502, 538，Dobo等的美国专利No. 3，542，615，Pike等的美国专利No. 5，382，400，在此出于所有目地将以上专利内容全文引入作为参考。 Shu cattle production spunbond web described and illustrated in, such as U.S. Pat. AdDeI No. 4, 340, 563, Dorschner et al U.S. Patent No. 3, 692, 618, Matsuki et al, U.S. Pat. No. 3,802 US Patent, 817, Kinney of Kinney, US Patent No. 3,338,992 and US Patent No. 3,341,394, Hartman, US Patent No. 3,502, 763, Levy and other 3,502, 538, Dobo et U.S. Patent No. 3,542,615, Pike et al, U.S. Pat. No. 5,382,400, herein for all purposes to the contents of the above patents incorporated herein by reference. 当将纺粘纤丝堆积在收集面上时，其通常是不粘的。 When the spunbond filaments are deposited on a collecting surface, which is generally not tacky. 纺粘纤丝可能有时具有小于约40微米的直径，经常为约5到约20微米。 Spunbond filaments may sometimes have diameters less than about 40 microns, often from about 5 to about 20 microns. 本文所使用的术语“多组分”指由至少两种聚合物组分形成的纤丝（例如，双组分纤丝）。  As used herein, the term "multicomponent" refers to a filament (e.g., bicomponent filaments) formed from at least two polymer components. 本发明涉及一种大体基本上连续的纤丝，其为生物可降解的。  The present invention generally relates to a substantially continuous filaments, which are biodegradable. 该纤丝包含由至少由一种高熔点聚酯形成的第一组分和由至少由一种低熔点聚酯形成的第二组分。 The filaments comprising a first component formed from at least from one high-melting polyester and a second component formed from at least one kind of low melting point polyester. 所述第一及第二组分可以任意期待的构造排列，如鞘核型，边靠边型，馅饼型，海岛型等。 The first and second components may be arranged in any configuration expected, such as sheath-core type, side by side type, a pie type, sea-island type. 无论如何，该低熔点聚酯是通过熔体混合聚合物及醇，以引发醇解反应而形成的脂肪族-芳香族共聚多酯，该醇解反应生成具有一个或多个羟烷基或烷基末端基团的共聚多酯。 In any case, the low melting point polyester is prepared by melt mixing the polymer and the alcohol to form the aliphatic initiate the alcoholysis reaction - aromatic copolyester, the alcoholysis reaction with one or more alkyl or hydroxyalkyl group copolyester ester end groups. 通过选择性控制醇解条件（例如，醇与共聚物的浓度，催化剂，温度等），可以制备分子量低于初始脂肪族-芳香族聚合物分子量的改性脂肪族-芳香族共聚多酯。 By selectively controlling alcoholysis conditions (e.g., an alcohol and the concentration of the copolymer, catalyst, temperature, etc. ), can be prepared by a molecular weight lower than the initial aliphatic - aromatic polymer molecular weight, modified aliphatic - aromatic copolyester. 这种低分子量聚合物也具有高熔体流动指数及低表观粘度的组合，该组合在形成基本上连续纤丝中有用。 This low molecular weight polymer compositions have a high melt flow index and a low apparent viscosity, the composition is useful in the substantially continuous filaments formed. 尽管未作要求，所述高熔点的聚酯一般构成第一组分的主要成分。  Although not required, the high-melting polyester is generally a main component constituting the first component. 也即，该聚酯可占第一组分的至少约80wt%，在一些实施方案中至少约90wt%，在一些实施方案中至少约95wt%。 That is, the polyester may comprise at least about 80wt% of the first component, in some embodiments at least about 90wt%, in some embodiments at least about 95wt%. 在这种实施方案中，第一组分的性质（如熔点）与所使用的聚酯的性质基本一致。 In such an embodiment, the first component properties (such as melting point) consistent with the nature of the polyester. 例如，第一组分的熔点可能为约150°C到250°C，在一些实施方案中为约160°C到240°C，在一些实施方案中为约170°C到220°C . For example, the first component may be the melting point to about 150 ° C 250 ° C, in some embodiments, from about 160 ° C to 240 ° C, in some embodiments, from about 170 ° C to 220 ° C.
 第二组分由一种或多种“低熔点”生物可降解芳香族-脂肪族共聚多酯形成。  The second component consisting of one or more "low melting point" biodegradable aromatic - aliphatic copolyester formed. 这种共聚多酯具有约50°C到约150°C的熔点，在一些实施方案中约80°C到约140°C，在一些实施方案中约90°C到约130°C。 Such copolyester having a melting point of about 50 ° C and approximately 150 ° C, in some embodiments from about 80 ° C to about 140 ° C, in some embodiments, from about 90 ° C to about 130 ° C. 而且，熔点也通常至少低于“高熔点”聚酯的熔点约30°C，在一些实施方案中低于其至少约40°C，在一些实施方案中低于其至少约50°C。 Further, usually at least below the melting point "melting point" melting point of the polyester from about 30 ° C, less than at least about 40 ° C, in some embodiments, less than about 50 ° C at least in some embodiments. 另外，其通常比多数“高熔点”聚酯在触觉上更软。 Further, it is generally softer than most "high melting point" polyester tactilely. 低熔点共聚多酯的玻璃化转变温度（“Tg”）也可能低于高熔点聚酯的玻璃化转变温度，以提高聚合物的柔韧性（flexibility)及可加工性。 Low melting point copolyester has a glass transition temperature ( "Tg") may also be below the glass transition temperature of the polyester high melting point, in order to increase the flexibility of the polymer (Flexibility) and workability. 例如，低熔点共聚多酯可具有约25°C或更低的Tg，在一些实施方案中约0°C或更低，在一些实施方案中约-io°c或更低。 For example, the low melting point copolyester may have from about 25 ° C or a Tg of less, in some embodiments from about 0 ° C or less, in some embodiments, from about -io ° c or lower. 这种玻璃化转变温度可能低于高熔点聚酯的玻璃化转变温度至少约5°C，在一些实施方案中至少约10°C，在一些实施方案中至少约15°C。 The glass transition temperature may be below the glass transition temperature of the polyester high melting point of at least about 5 ° C, in some embodiments at least about 10 ° C, in some embodiments at least about 15 ° C. 正如下文更详细地讨论的，所述熔融温度及玻璃化转变温度可按照ASTM D-3417采用差示扫描量热计(“DSC”）测定。 As discussed in more detail below, the melting temperature and glass transition temperature using a differential scanning calorimeter ( "DSC") was measured according to ASTM D-3417. 通常来讲，所述脂肪族-芳香族共聚多酯通过将聚合物与醇熔体混合以引发醇解反应制得，所述醇解反应生成具有一个或多个羟烷基或烷基末端基团的共聚多酯。  In general, the aliphatic - aromatic copolyester by melt mixing the polymer with an alcohol to initiate one or more alkyl or hydroxyalkyl group having alcoholysis reaction solution prepared by reacting the alcohol copolyester ester end groups. 醇解反应组分和技术的各种实施方案将在下文中更详细说明。 Alcoholysis reaction components and techniques of various embodiments will be described in more detail below. A脂肪族-芳香族共聚多酯 脂肪族-芳香族共聚多酯可能通过任意已知技术合成，例如通过多羟基化合物与脂肪族和芳香族的二羧酸或其酐缩合聚合制成。  A aliphatic - aromatic copolyester  aliphatic - aromatic copolyester may be synthesized by any known technique, for example, by condensation of a polyhydroxy compound and an aliphatic and aromatic dicarboxylic acids or their anhydrides and polymerizing. 多羟基化合物可为取代的或未取代的，直链的或分枝的，选自具有2到12个碳原子的多羟基化合物及具有2到8个碳原子的聚亚烷基醚二醇（polyalkylene etherglycol)的多轻基化合物。 Polyhydroxy compounds may be polyhydroxy compound is a substituted or unsubstituted, linear or branched, selected from the group having from 2 to 12 carbon atoms and polyalkylene ether glycols having from 2 to 8 carbon atoms ( polyalkylene etherglycol) a plurality of light-based compound. 可用的多轻基化合物的例子包括但不限于乙二醇，二甘醇，丙二醇，1,2-丙二醇，1,3-丙二醇，2，2- 二甲基-1，3-丙二醇，I，2-丁二醇，I，3-丁二醇，I，4-丁二醇，I，2-戊二醇，I，5-戊二醇，I，6-己二醇，聚乙二醇，二甘醇，2, 2,4_二甲基-1,6_己二醇，硫二甘醇，1，3_环己烧二甲醇，1，4_环己烧二甲醇,2,2，4，4_四甲基-1，3-环丁二醇，环戊二醇，三甘醇，以及四甘醇。 Examples of multiple light based compound can be used include but are not limited to, ethylene glycol, diethylene glycol, propylene glycol, 1,2-propanediol, 1,3-propanediol, 2,2-dimethyl-1,3-propanediol, I, 2- butanediol, I, 3- butanediol, I, 4- butanediol, the I, 2- pentanediol, I, 5- pentanediol, I, 6- hexylene glycol, polyethylene glycol, , diethylene glycol, 2, 2,4_ dimethyl -1,6_ hexanediol, thiodiglycol, 1,3_ cyclohexyl dimethanol burn, burn 1,4_ cyclohexyl dimethanol, 2, 2,4,4_ tetramethyl-1,3-cyclobutanediol, cyclopentane diol, triethylene glycol, and tetraethylene glycol. 优选的多羟基化合物包括1，4_ 丁二醇，1，3-丙二醇，乙二醇，1,6-己二醇，二甘醇，以及1，4_环己烷二甲醇。 Preferred polyhydroxy compounds include 1,4_ butanediol, 1,3-propanediol, ethylene glycol, 1,6-hexanediol, diethylene glycol, cyclohexanedimethanol and 1,4_. 代表性的可用的脂肪族二羧酸包括取代的或未取代的，直链的或分枝的，选自具有2到约12个碳原子的脂肪族二羧酸的非芳香性的二羧酸，及其衍生物。  Representative of useful aliphatic dicarboxylic acids include substituted or unsubstituted, linear or branched, selected from non-aromatic dicarboxylic acids having aliphatic 2 to about 12 carbon atoms, dicarboxylic acids, and derivatives thereof. 脂肪族二羧酸的非限制性例子包括丙二酸，琥珀酸，草酸，戊二酸，己二酸，庚二酸，壬二酸，癸二酸，反丁烯二酸，2，2- 二甲基戊二酸，辛二酸，1,3-环戊烷二羧酸，1，4-环己烷二羧酸，1，3-环己烷二羧酸，二甘醇酸，衣康酸，马来酸，以及2，5-降冰片烷二羧酸。 Non-limiting examples of aliphatic dicarboxylic acids include malonic acid, succinic acid, oxalic acid, glutaric acid, adipic acid, pimelic acid, azelaic acid, sebacic acid, fumaric acid, 2,2 dimethyl glutaric acid, suberic acid, 1,3-cyclopentane dicarboxylic acid, 1,4-cyclohexanedicarboxylic acid, 1,3-cyclohexanedicarboxylic acid, diglycolic acid, itaconic itaconic acid, maleic acid, and 2,5-norbornane dicarboxylic acid. 可使用的代表性的芳香族二羧酸包括取代的或未取代的，直链的或分枝的，选自含有I到约6个碳原子的芳香族二羧酸的芳香族二羧酸，及其衍生物。 May be used Representative aromatic dicarboxylic acids include substituted or unsubstituted, linear or branched, aromatic dicarboxylic acids selected from the group comprising I to about 6 carbon atoms, aromatic dicarboxylic acid, and derivatives thereof. 芳香族二羧酸的非限制性例子包括对苯二酸，对苯二甲酸二甲酯，间苯二甲酸，间苯二甲酸二甲酯，2，6_萘二酸，2，6_萘二酸二甲酯，2，7-萘二酸，2，7_萘二酸二甲酯，3，4' -二苯醚二甲酸，3，4' -二苯醚二甲酸二甲酯，4，4' - 二苯醚二甲酸，4，4' -二苯醚二甲酸二甲酯，3，4' -二苯硫醚二甲酸，3，4' -二苯硫醚二甲酸二甲酯，4，4' -二苯硫醚硫醚二甲酸，4，4' -二苯硫醚二甲酸二甲脂，3，4' -二苯砜二甲酸，3，4' -二苯砜二甲酸二甲酯，4，4' -二苯砜二甲酸，4，4' -二苯砜二甲酸二甲酯，3，4/ -苯甲酮二甲酸，3，4"-苯甲酮二甲酸二甲酯，4，4'-苯甲酮二甲酸，4，4'-苯甲酮二甲酸二甲酯，1，4-萘二酸，1，4-萘二酸二甲酯，4，4-亚甲基二（苯甲酸），4，4' -亚甲基二（苯甲酸）二甲酯等，及其混合物。 Non-limiting examples of aromatic dicarboxylic acids include terephthalic acid, dimethyl terephthalate, isophthalic acid, dimethyl isophthalate, naphthalene dicarboxylic acid 2,6_, 2,6_ naphthalene of dimethyl 2,7-naphthalene dicarboxylic acid, 2,7_ naphthalene dicarboxylate, 3,4 '- diphenyl ether dicarboxylic acid, 3,4' - diphenyl ether dicarboxylate, 4,4 '- diphenyl ether dicarboxylic acid, 4,4' - diphenyl ether dicarboxylate, 3,4 '- diphenyl sulfide dicarboxylic acid, 3,4' - diphenyl sulfide dicarboxylic acid dimethyl ester, 4,4 '- diphenyl sulfide sulfide dicarboxylic acid, 4,4' - diphenyl sulfide dicarboxylic acid dimethyl ester, 3,4 '- diphenyl sulfone dicarboxylic acid, 3,4' - diphenylsulfone dicarboxylate, 4,4 '- diphenyl sulfone dicarboxylic acid, 4,4' - diphenyl sulfone dicarboxylate, 3,4 / - benzophenonedicarboxylic acid, 3,4 '- benzophenone dicarboxylate, 4,4'-benzophenone dicarboxylic acid, 4,4'-dimethyl benzophenone, 1,4-naphthalene dicarboxylic acid, 1,4-naphthalene dicarboxylic acid dimethyl ester, 4,4-methylene bis (benzoic acid), 4,4 '- methylene bis (benzoic acid), dimethyl and the like, and mixtures thereof. 所述聚合可由催化剂催化，所述催化剂如基于钛的催化剂（例如钛酸四异丙酯，四异丙氧基钛（tetraisopropoxy titanium) ,二丁氧基二乙酰乙酸基钛或钛酸四丁酯）。  The polymerization catalyst may be a catalyst such as a titanium-based catalysts (e.g., tetraisopropyl titanate, titanium tetraisopropoxide (tetraisopropoxy titanium), dibutoxy titanium or acetoacetate titanate tetrabutyl). 如期望，可将二异氰酸酯链扩展剂与共聚多酯反应以增加其分子量。 As desired, the diisocyanate chain extender reacted with the copolymerized polyester to increase its molecular weight. 代表性的二异氰酸酯可包括甲苯_2，4- 二异氰酸酯，甲苯-2，6- 二异氰酸酯，2，4' - 二苯基甲烷二异氰酸酯，亚萘基-1，5-二异氰酸酯，亚二甲苯基二异氰酸酯，1，6_己二异氰酸酯（“HMDI”），异佛尔酮二异氰酸酯以及亚甲基二（2-异氰酸根络环己烷）。 Representative diisocyanates may include toluene _2,4- diisocyanate, toluene-2,6-diisocyanate, 2,4 '- diphenylmethane diisocyanate, naphthylene-1,5-diisocyanate, ethylene two tolyl diisocyanate, hexyl diisocyanate 1,6_ ( "HMDI"), isophorone diisocyanate and methylene bis (2-isocyanato-cyclohexane). 也可使用含有异氰脲酸酯和/或联二脲基团且具有不少于三个官能度的三官能团异氰酸酯化合物，或利用三或多异氰酸酯部分代替二异氰酸酯。 Also containing isocyanurate and / or biurea groups and having a functionality of less than three trifunctional isocyanate compound, or the use of tri- or polyisocyanate partially replaced diisocyanate. 优选地二异氰酸酯为1，6_己二异氰酸酯。 Preferably the diisocyanate is hexamethylene diisocyanate 1,6_. 所述链扩展剂的用量通常为基于聚合物总重百分比的约0. 3到约3. 5wt%，在一些实施方案中为约0. 5到约2. 5wt%。 The chain extending agent is generally used in an amount, based on the total weight of polymer from about 0.3 percent to about 3. 5wt%, in some embodiments, from about 0.5 to about 2. 5wt%. 所述共聚多酯可为线性聚合物或长链分枝的聚合物。  The copolyester may be a linear polymer or a long-chain branched polymer. 长链分枝聚合物通常通过使用低分子量支化试剂，例如多羟基化合物，多元羧酸，醇酸等等来制备。 Long chain branched polymer, typically by using a low molecular weight branching agent, such as polyhydroxy compounds, polycarboxylic acid, etc. alkyd prepared. 可用作支化试剂的代表性的低分子量多羟基化合物包括甘油，三羟甲基丙烷，三羟甲基乙烷，聚醚三醇，甘油，1，2，4_ 丁三醇，季戊四醇，1，2，6_己三醇，山梨醇，1，1，4，4_四羟甲基环己烷，三（2-羟乙基）异氰脲酸酯，以及二季戊四醇。 Representative agents useful branched low molecular weight polyhydroxy compounds include glycerol, trimethylolpropane, trimethylolethane, polyether triol, glycerol, 1,2,4_ butanetriol, pentaerythritol, 1 , 2,6_ hexanetriol, sorbitol, 1,1,4,4_ tetrakis (hydroxymethyl) cyclohexane, tris (2-hydroxyethyl) isocyanurate, and dipentaerythritol. 代表性的可用作支化试剂的高分子量多羟基化合物(分子量400到3000)包括具有2到3个碳原子的烯化氧缩合产生的三元醇，例如带有多羟基化合物引发剂的环氧乙烷及环氧丙烷。 Representative high molecular weight may be used as branching agent polyol (molecular weight 400 to 3000) comprises an alkylene oxide triol having 2-3 carbon atoms resulting from the condensation, such as cyclic polyhydroxy initiator compound of ethylene oxide and propylene oxide. 可用作支化试剂的代表性的多元羧酸包括苯连三酸，1，2，4-苯三酸（1，2，4-苯三甲酸）及其酸酐，1，3，5-苯三酸（1，3，5-苯三甲酸），1，2，4，5-苯四酸及其酸酐，苯四甲酸，苯甲酮四甲酸，1，1，2，2-乙烷四甲酸，1，1，2-乙烷三甲酸，1，3，5_戊烷三甲酸以及1，2，3，4_环戊烷四甲酸。 Representative useful as branching agent include polycarboxylic acids hemimellitic acid, trimellitic acid (1,2,4-benzenetricarboxylic acid) and its anhydride, trimesic tricarboxylic acid (1,3,5-benzenetricarboxylic acid), pyromellitic acid and its anhydride, pyromellitic acid, benzophenone tetracarboxylic acid, 1,1,2,2-ethane tetracarboxylates acid, 1,1,2-ethane-tricarboxylic acid, pentane-tricarboxylic acid and 1,2,3,4_ 1,3,5_ cyclopentane tetracarboxylic acid. 可用作支化试剂的代表性醇酸包括苹果酸，柠檬酸，酒石酸，3-羟基戊二酸，粘酸，三羟基戊二酸，4-羧基邻苯二甲酸酐，羟基间苯二甲酸，及4-(β-羟乙基）邻苯二甲酸。 Representative alkyd useful as branching agent include m-malic acid, citric acid, tartaric acid, 3 -hydroxy glutaric acid, mucic acid, trihydroxy glutaric acid, phthalic anhydride, 4-carboxy, hydroxy acid and 4- (β- hydroxyethyl) phthalic acid. 这种羟基酸包括三种或更多种羟基和羧基的组合。 Such hydroxy acids include a combination of three or more hydroxyl and carboxyl groups. 尤其优选的支化试剂包括1，2，4-苯三酸，1,3,5-苯三酸，季戊四醇，三羟甲基丙烷及1,2,4- 丁三醇。 Especially preferred branching agents include trimellitic acid, trimesic acid, pentaerythritol, trimethylol propane and 1,2,4-butanetriol. 芳香族二羧酸单体成分可以约10摩尔％到约40摩尔％的量存在于共聚多酯中，在一些实施方案中为约15摩尔％到约35摩尔％，在一些实施方案中为约15摩尔％到约30摩尔％。 The amount of  an aromatic dicarboxylic acid monomer component can be from about 10 mole% to about 40 mole% based on copolyester, in some embodiments, from about 15 mole% to about 35 mole%, in some embodiments, from about 15 mole% to about 30 mole%. 脂肪族二羧酸单体成分可能同样地以约15摩尔％到约45摩尔％的量存在于共聚多酯中，在一些实施方案中为20摩尔％到约40摩尔％，在一些实施方案中为25摩尔％到约35摩尔％。 Aliphatic dicarboxylic acid monomer constituent may likewise be present in an amount from about 15 mole% to about 45 mole% based on copolyester, in some embodiments from about 20 mol% to 40 mol%, in some embodiments about 25 mol% to 35 mol%. 多羟基化合物单体成分也可以约30摩尔％到约65摩尔％的量存在于脂肪族-芳香族共聚多酯中，在一些实施方案中为40摩尔％到约50摩尔％，在一些实施方案中为45摩尔％到约55摩尔％。 Polyhydroxy compound monomer component may also be an amount from about 30 mole% to about 65 mole% based on the aliphatic - aromatic copolyester, in some embodiments from about 40 mol% to 50 mol%, in some embodiments, for about 45 mole% to 55 mole%. y为大于I的整数。  y is an integer greater than I. 如此的共聚多酯的一个例子是聚己二酸对苯二甲酸丁二酯(polybutylene adipate terephthalate),其可以商品名EC0FLEX:®FBX 7011 商购于BASFCorp0包含芳香族对苯二酸单体成分的共聚多酯的另一个合适的例子为以商品名ENP0L™8060M获自IRE Chemicals (SouthKorea)。 An example of such a copolyester is polybutylene adipate terephthalate (polybutylene adipate terephthalate), available under the trade name EC0FLEX: ®FBX 7011 commercially available from BASFCorp0 aromatic monomer component comprising terephthalic acid another example of a suitable copolyester tradename ENP0L ™ 8060M available from IRE Chemicals (SouthKorea). 其他适合的脂肪族-芳香族共聚多酯可被描述于美国专利5，292，783 ;5，446，079 ;5，559，171 ;5，580，911 ;5，599，858 ;5，817，721 ；5，900，322 ;及6，258, 924中，为了所有目的将其全文引入作为参考。 Other suitable aliphatic - aromatic copolyester may be described in U.S. Patent No. 5,292,783; 5,446,079; 5,559,171; 5,580,911; 5,599,858; 5,817 , 721; 5,900,322; and 6,258, 924, for all purposes in its entirety incorporated herein by reference. 所述脂肪族-芳香族聚酯通常具有约40，000到约120，000克每摩尔的数均分子量（“Mn”），在一些实施方案中为约50，000到约100，000克每摩尔，在一些实施方案中为约60，000到约85，000克每摩尔。  The aliphatic - aromatic polyesters typically about 40,000 grams per mole to about 120,000 number average molecular weight ( "Mn"), in some embodiments, from about 100 to about 50,000, 000 grams per mole, in some embodiments, from about 60,000 to about 85,000 grams per mole. 同样地，所述聚合物通常也具有约70，000到约240，000克每摩尔的重均分子量（“Mw”），在一些实施方案中为约80，000到约190，000克每摩尔，在一些实施方案中为约100，000到约150，000克每摩尔。 Likewise, the polymer also typically have from about 70,000 to about 240,000 grams per mole weight average molecular weight ( "Mw"), in some embodiments, from about 80,000 to about 190,000 grams per mole , in some embodiments, from about 100,000 to about 150,000 grams per mole. 重均分子量和数均分子量的比值(“Mw/Mn”）也就是“多分散系数”也相对较低。 A weight-average ratio of number average molecular weight ( "Mw / Mn") is the molecular weight, "polydispersity index" is relatively low. 例如多分散系数通常为约I. O到约3. 0，在一些实施方案中为从约I. 2到约2. O，在一些实施方案中为约I. 4到约I. 8。 For example the polydispersity index is generally from about 3.0 to about I. O, in some embodiments from about I. 2 to about 2. O, in some embodiments, from about I. 4 to about I. 8. 重均及数均分子量可由本领域技术人员公知的方法测定。 The weight average and number average molecular weight determined by one of skill in the art well known methods. 所述芳香族-脂肪族聚酯也可能具有在170°C及剪切速率为IOOOiT1下测得的约100到约1000帕斯卡秒（Pa · S)的表观粘度，在一些实施方案中为约200到约800帕斯卡秒（Pa · s),在一些实施方案中为约300到约600帕斯卡秒（Pa · s)。  The aromatic - aliphatic polyesters may also have at 170 ° C and a shear rate of from about 100 to about 1000 Pascal seconds (Pa · S) is the apparent viscosity measured at IOOOiT1, in some embodiments, from about 200 to about 800 Pascal seconds (Pa · s), in some embodiments, from about 300 to about 600 Pascal seconds (Pa · s). 所述芳香族_脂肪族聚酯的熔体流动指数也可为约O. I到约10克每10分钟，在一些实施方案中为约O. 5克到约8克每10分钟，在一些实施方案中为约I克到约5克每10分钟。 _ The aromatic aliphatic polyesters may also be a melt flow index of from about O. I to about 10 grams per 10 minutes, in some embodiments, from about O. 5 grams to about 8 grams per 10 minutes, in some embodiments from about I gram to about 5 grams per 10 minutes. 所述熔体流动指数为按照ASTM测试方法D1238-E进行测量，在10分钟内、在特定温度下（例如190°C )，可从挤出流变仪孔（O. 0825英寸直径）中强行通过的聚合物的重量（克）。 The melt flow index was measured according to ASTM Test Method D1238-E, in 10 minutes, at a certain temperature (e.g. 190 ° C), can be forced from the extrusion rheometer orifice (O. 0825 inch diameter) in by weight of polymer (g). 如前所示，脂肪族-芳香族共聚多酯可与醇反应，以形成具有降低了的分子量的改性共聚多酯。  As previously indicated, aliphatic - aromatic copolyester may be reacted with an alcohol, to form a modified have a reduced molecular weight of the copolyester. 醇反应物的浓度可影响分子质量改变的程度。 Concentration of the alcohol reactant can affect the degree of molecular mass changes. 例如，更高醇浓度一般导致更明显的分子质量下降。 For example, a higher concentration of alcohol generally leads to a more pronounced decline in molecular mass. 当然，过高的醇浓度也可影响生成的聚合物物理性质。 Of course, high concentrations of alcohol may also affect the physical properties of the resulting polymer. 因此，在多数实施方案中，醇的用量为基于起始脂肪族-芳香族共聚多酯的总重量的O. lwt%到10wt%，在一些实施方案中为O. Iwt%到4wt%,在一些实施方案中为约O. 2wt%到约Iwt%。 Thus, in most embodiments, the alcohol is used in an amount based on the starting aliphatic - aromatic copolymer polyesters total weight of O. lwt% to 10wt%, in some embodiments from O. Iwt% to 4wt%, in some embodiments from about to about O. 2wt% Iwt%. 所述醇可为单羟基或多羟基的（二羟基，三羟基，四羟基等），饱和的或不饱和的， 以及任选可被功能基团取代，如羧基，氨基等。  The alcohol may be monohydric or polyhydric (dihydroxy, trihydroxy, tetrahydroxy etc. ), saturated or unsaturated, and which may be optionally substituted with functional groups, such as carboxyl, amino and the like. 合适的单羟基醇的例子包括甲醇，乙醇，I-丙醇，2-丙醇，I- 丁醇，2- 丁醇，I-戊醇，2-戊醇，3-戊醇，I-己醇，2-己醇，3-己醇，I-庚醇，2-庚醇，3-庚醇，4-庚醇，I-辛醇，2-辛醇，3-辛醇，4-辛醇，I-壬醇，2-壬醇，3-壬醇，4-壬醇，5-壬醇，I-癸醇，2-癸醇，3-癸醇，4-癸醇，5-癸醇，烯丙醇，I- 丁烯醇，2- 丁烯醇，I-戊烯醇，2-戊烯醇，I-己烯醇，2-己烯醇，3-己烯醇，I-庚烯醇，2-庚烯醇，3-庚烯醇，I-辛烯醇，2-辛烯醇，3-辛烯醇，4-辛烯醇，I-壬烯醇，2-壬烯醇，3-壬烯醇，4-壬烯醇，I-癸烯醇，2-癸烯醇，3-癸烯醇，4-癸烯醇，5-癸烯醇，环己醇，环戊醇，环庚醇，I-苯基乙醇（l-phenythylalC0h0l)，2-苯基乙醇，2-乙氧基乙醇，甲醇胺，乙醇胺，等等。 Examples of suitable monohydric alcohols include methanol, ethanol, I- propanol, 2-propanol, I- butanol, 2-butanol, I- pentanol, 2-pentanol, 3-pentanol, I- hexyl alcohol, 2-hexanol, 3-hexanol, I- heptanol, 2-heptanol, 3-heptanol, 4-heptanol, I- octanol, 2-octanol, 3-octanol, 4-octyloxy alcohols, I- nonanol, 2-nonanol, 3-nonanol, 4-nonanol, 5-nonanol, I- decanol, 2-decanol, 3-decanol, 4-decanol, 5-decyl alcohol, allyl alcohol, I- butenol, 2-butenol, I- pentyl alcohol, 2-pentyl alcohol, I- hexyl alcohol, 2-hexyl alcohol, 3-hexyl alcohol, I- heptyl alcohol, 2-heptyl alcohol, 3-heptyl alcohol, I- octenol, 2-octenol, 3-octenol, 4-octenol, I- nonyl alcohol, 2-nonene alcohol, 3-nonenol, 4-nonyl alcohol, I--decenol, 2-decenol, 3-decenol, 4-decenol, 5-decenol, cyclohexanol, cyclopentanol alcohol, cyclohexyl alcohol, I- phenylethanol (l-phenythylalC0h0l), 2- phenylethanol, 2-ethoxyethanol, methanol, ethanol amine, and the like. 适用的二羟基醇的例子包括I，3-丙二醇，I，4-丁二醇，I，5-戊二醇，I，6-己二醇，I，7-庚二醇，I，8-辛二醇，1，2-环己烷二甲醇，1，3-环己烷二甲醇，I-羟甲基-2-羟乙基环己烷，I-羟基-2-羟丙基环己烷，I-羟基-2-羟乙基环己烷，I-羟甲基-2-羟乙基苯，I-羟甲基-2-羟丙基苯，I-轻基-2-轻乙基苯，1,2-苯甲基甲基醇(I, 2-benzylmethylol) ,1,3-苯甲基二甲基醇(I, 3-benzyl dimethylol)等等。 Examples of suitable dihydric alcohols include I, 3- propanediol, I, 4- butanediol, I, 5- pentanediol, I, 6- hexanediol, I, 7- heptanediol, I, 8- octanediol, 1,2-cyclohexanedimethanol, 1,3-cyclohexanedimethanol, I- hydroxymethyl-2-hydroxyethyl cyclohexane, I- cyclohexyl-hydroxy-2-hydroxypropyl alkyl, I- hydroxy-2-hydroxyethyl-cyclohexane, I- hydroxymethyl-2-hydroxyethyl benzene, I- hydroxymethyl-2-hydroxypropyl benzene, I- b light light-2- benzene, 1,2-methyl alcohol (I, 2-benzylmethylol), 1,3- dimethyl benzyl alcohol (I, 3-benzyl dimethylol) and the like. 适用的三元醇可包括甘油,三轻甲基丙烧等,而合适的四元醇可包括季戊四醇，赤藓醇等。 Suitable trihydric alcohols may include glycerol, tris-methylpropan-burning light, etc., and may be suitable tetraols include pentaerythritol, erythritol and the like. 优选的醇为具有2到6个碳原子的二元醇，如1，3_丙二醇和I，4-丁二醇。 Preferred alcohols are glycols having from 2 to 6 carbon atoms, such as propylene glycol and 1,3_ I, 4- butanediol. R1及R2独立地选自氢；羟基；直链或分枝的，取代或未取代的C1-Cltl烷基；直链或分枝的，取代或未取代的C1-Cltl羟烷基。  R1 and R2 are independently selected from hydrogen; hydroxyl group; straight chain or branched, substituted or unsubstituted C1-Cltl alkyl group; a linear or branched, substituted or unsubstituted hydroxyalkyl group of C1-Cltl . 优选地,R1和R2中至少一个，或者两者均为直链或分枝的，取代或未取代，C1-Cltl烷基或C1-Cltl羟烷基，在一些实施方案中为C1-C8烷基或C1-C8羟烷基，在一些实施方案中为C2-C6烷基或C2-C6-烷基。 Preferably, R1, and R2 is at least one, or both are a straight-chain or branched, substituted or unsubstituted, C1-Cltl C1-Cltl alkyl or hydroxyalkyl group, in some embodiments, is C1-C8 alkyl hydroxyalkyl group or C1-C8 alkyl, in some embodiments from C2-C6 alkyl or C2-C6- alkyl. 适用的烷基或羟烷基的例子包括，例如，甲基，乙基，异丙基，正丙基，正丁基，异丁基，仲丁基，叔丁基，正戊基，正己基，正庚基，正辛基，正癸基，I-羟基乙基，2-羟基乙基，3-羟基丙基，4-羟基丁基，以及5-羟基戊基。 Examples of suitable alkyl or hydroxyalkyl group include, for example, methyl, ethyl, isopropyl, n-propyl, n-butyl, isobutyl, sec-butyl, tert-butyl, n-pentyl, n-hexyl , n-heptyl, n-octyl, n-decyl, I- hydroxyethyl, 2-hydroxyethyl, 3-hydroxypropyl, 4-hydroxybutyl and 5-hydroxypentyl. 因此，如所示的，改性的脂肪族-芳香族共聚多酯与未经改性的共聚多酯相比，就末端基团而言，具有不同的化学组成。 Thus, e.g., as shown in a modified aliphatic - aromatic copolyester as compared with unmodified copolyesters, in terms of end group, having a different chemical composition. 该末端基团可能在决定该聚合物的性质中起到重要的作用，例如其反应性，稳定性等。 The terminal groups may determine the nature of the polymer plays an important role, for example, reactivity, stability and the like. 不管其特定结构如何，在醇解过程中产生了新聚合物种类，其具有低于起始聚酯的分子量的分子量。  Regardless of its specific structure, resulting in a new polymer species alcoholysis process, having a molecular weight lower than the molecular weight of the starting polyester. 所述重均和/或数均分子量可能，例如，都被减少，使得起始共聚多酯分子量和新分子量之间的比值至少为约I. 1，在一些实施方案中至少为约I. 4，在一些实施例中至少为约I. 6。 The weight-average and / or a number average molecular weight may be, for example, have been reduced, such that the copolymerization ratio between the initial molecular weight of the polyester and a molecular weight of at least about new I. 1, in some embodiments at least about I. 4 in some embodiments, at least about I. 6. 例如，改性的脂肪族-芳香族共聚多酯可能具有约10，000到约70，000克每摩尔的数均分子量（“Mn”)，在一些实施方案中为约20，000到约60，000克每摩尔，在一些实施方案中为约30，000到约55，000克每摩尔。 For example, a modified aliphatic - aromatic copolyester may have from about 10,000 to about 70,000 grams per mole to a number average molecular weight ( "Mn"), in some embodiments, from about 20,000 to about 60 , 000 grams per mole, in some embodiments, from about 30,000 to about 55,000 grams per mole. 同样地，改性的共聚多酯也可具有约20，000到约125，000克每摩尔的重均分子量（“Mw”），在一些实施方案中为约30，000到110, 000克每摩尔，在一些实施方案中为约40，000到约90，000克每摩尔。 Similarly, the modified copolyester may also have from about 20,000 to about 125,000 grams per mole weight average molecular weight ( "Mw"), in some embodiments, from about 30,000 to 110,000 grams per mole, in some embodiments, from about 40,000 to about 90,000 grams per mole. 尽管与起始聚合物在特定性质方面具有差异，改性的共聚多酯可能仍然保持起始聚合物的其他性质，以增强聚合物的柔韧性和可处理性。  Although the starting polymer have a difference in specific properties, modified copolyester may still retaining other properties of the starting polymer, in order to enhance the flexibility and processability of the polymer. 例如,热学性能（例如Tg，Tm及熔化潜热）通常保持与起始聚合物基本上相同，例如在前述范围之内。 For example, thermal properties (e.g., Tg, Tm and latent heat of fusion) typically remains substantially the same as the starting polymer, for example, within the aforementioned range. 更进一步地，尽管实际的分子量可能变化，改性的共聚多酯的多分散指数可能保持与起始聚合物基本上相同，例如在约I. O到约3. O的范围内，在一些实施方案中为约I. I到约2. O，在一些实施方案中约I. 2 到约I. 8。 Still further, although the actual molecular weight may vary, polydispersity index copolymer modified polyester may remain substantially the same as the starting polymer, for example in the range of from about to about I. O 3. O, in some embodiments embodiment from about I. I to about 2. O, in some embodiments from about 2 to about I. I. 8. 典型地，改性的脂肪族-芳香族共聚多酯构成第二组分的主要成分。  Typically, the modified aliphatic - aromatic copolyester composed of a main component of the second component. 也即，改性的共聚多酯可能占第二组分的至少约90wt%，在一些实施方案中为至少约92wt%，在一些实施方案中为至少约95wt%。 That is, the modified copolyester may comprise at least about 90wt% of the second component, in some embodiments, at least about 92wt%, in some embodiments, at least about 95wt%. 在这种实施方案中，第二组分的性质（如熔点）会基本上与所使用的改性的共聚多酯一致。 In this embodiment, the second component properties (e.g., melting point) will be substantially identical to the modified copolyester used. 可采用催化剂以促进醇解反应的改性。  The catalyst can be modified to facilitate the alcoholysis reaction. 催化剂的浓度可能影响分子量所改变的程度。 The concentration of the catalyst may influence the extent of change in molecular weight. 例如，更高的催化剂浓度通常导致更显著的分子量降低。 For example, higher catalyst concentrations generally result in more pronounced reduction in molecular weight. 当然，过高的催化剂浓度也可能影响得到的聚合物的物理性质。 Of course, high catalyst concentration may also affect the physical properties of the resulting polymer. 因此，在多数实施方案中，催化剂的用量为基于起始脂肪族-芳香族共聚多酯的重量的约50到约2000份每一百万份（“ppm”)，在一些实施方案中约100到约lOOOppm，在一些实施方案中为约200到约lOOOppm。 Thus, in most embodiments, the amount of catalyst based on the aliphatic starting - from about 50 to about 2000 parts per million parts by weight of an aromatic copolyester ( "ppm"), in some embodiments from about 100 to about lOOOppm, in some embodiments, from about 200 to about lOOOppm. 任何已知的催化剂均可用于本发明以完成所期待的反应。  Any known catalysts can be used in the present invention is expected to complete the reaction. 在一个实施方案中，例如，可以使用过渡金属催化剂，例如基于IVB族金属或IVA族金属的催化剂（例如醇盐或盐）。 In one embodiment, for example, using a transition metal catalyst, such as a catalyst or a Group IVB metal of Group IVA metals (e.g., salt or alcohol) based. 基于钛、锆和/或锡的金属催化剂是特别期望的且其可包括例如，丁氧基钛，四丁氧基钦，丙氧基钦，异丙氧基钦，苯氧基钦，丁氧基错，氧化_■丁锡，_■乙酸_■丁锡，苯氧基锡，羊酸锡，硬脂酸锡，二辛酸二丁锡，马来酸二油基酯二丁锡（dibutyltindioleymaleate),马来酸二丁酯二丁锡，二月桂酸二丁锡，1，1，3，3-四丁基-1，3-二月桂氧羰基二锡氧烷（1，1，3，3-tetrabutyl-l, 3-dilauryIoxycarbonyIdistannoxane), 二乙酸二丁锡，二乙酸丙酮酸酯二丁锡（dibutyltin diacetylacetonate),双（邻苯基苯酹）二丁锡,双（三乙氧基娃酸）二丁锡，二硬脂酸二丁锡，双（3-巯基丙酸异壬酯）二丁锡（dibutyltin bis (isononyl-3-mercaptopropionate)),双（巯基乙醇酸异辛酯）二丁锡，氧化二辛锡，二月桂酸二辛锡，二乙酸二辛锡以及二柯赫酸二辛锡（dioctyltin diversatate)。 Metal-based catalyst of titanium, zirconium and / or tin, which are particularly desirable and may include, for example, butoxy titanium tetrabutoxide Kitchin, Kitchin propoxy, isopropoxy Kitchin, Kitchin phenoxy, butoxy wrong group, tributyltin oxide, ■ _, _ ■ _ ■ tributyl tin acetate, tin phenoxy, sheep acid, stannous stearate, dibutyltin dioctoate, oleyl maleate, dibutyltin (dibutyltindioleymaleate) , dibutyltin dibutyl maleate, dibutyltin dilaurate, 1,1,3,3 dilauryl oxycarbonyl -distannoxane (1,1,3,3 -tetrabutyl-l, 3-dilauryIoxycarbonyIdistannoxane), dibutyltin diacetate, dibutyltin diacetate, dibutyltin pyruvate (dibutyltin diacetylacetonate), bis (o-phenylphenol sprinkle) dibutyltin, bis (triethoxysilyl baby acid) dibutyltin distearate, dibutyltin bis (isononyl 3-mercaptopropionic acid ester) dibutyl tin (dibutyltin bis (isononyl-3-mercaptopropionate)), bis (isooctyl thioglycolate) dibutyltin , dioctyl tin oxide, dioctyl tin dilaurate, dioctyl tin diacetate, dioctyl tin versatate and two (dioctyltin diversatate). 该醇解反应通常在除醇反应物外，没有溶剂的情况下进行。  The reaction solution of the alcohol is generally the alcohol reactant in the other outside, carried out without solvent. 尽管如此，在本发明的一些实施方案中可以使用共溶剂。 Nevertheless, in some embodiments of the present invention may be used in a co-solvent. 在一个实施方案中，例如，共溶剂可促进催化剂在反应物醇中中的分散。 In one embodiment, for example, co-solvents can facilitate dispersion of the catalyst in the reactants in an alcohol. 适用的共溶剂的例子包括醚，如乙醚，苯甲醚，四氢呋喃，乙二醇二甲醚，三甘醇二甲醚，四甘醇二甲醚，二噁烷等；醇，如甲醇，乙醇，正丁醇，苯甲醇，乙二醇，二甘醇等；酚，如苯酚等；羧酸，如甲酸，乙酸，丙酸，甲基苯甲酸等；酯，如乙酸甲酯，乙酸丁酯，苯甲酸苯甲酯等；芳香烃，如苯，甲苯，乙苯，1，2，3，4_四氢化萘等；脂肪烃，如正己烧，正辛烷，环己烷等；卤化的烃，如二氯甲烷，三氯甲烷，氯苯等；硝基化合物，例如硝基甲烧，硝基苯等；脲（carbamide)，如N，N-二甲基甲酰胺，N，N-二甲基乙酰胺，N-甲基吡咯烷酮等；尿素类，如N，N-二甲基咪唑啉酮等；砜类，如二甲基砜等；亚砜，如二甲基亚砜等；内酯，如丁内酯，己内酯等；碳酸酯，如碳酸二甲酯，碳酸亚乙酯等。 Examples of suitable co-solvents include ethers, such as diethyl ether, anisole, tetrahydrofuran, ethylene glycol dimethyl ether, triethylene glycol dimethyl ether, tetraethylene glycol dimethyl ether, dioxane and the like; alcohols such as methanol, ethanol, , n-butanol, benzyl alcohol, ethylene glycol, diethylene glycol and the like; phenols, such as phenol and the like; carboxylic acids such as formic acid, acetic acid, propionic acid, toluic acid and the like; esters such as methyl acetate, butyl acetate , benzyl benzoate and the like; aromatic hydrocarbons such as benzene, toluene, ethylbenzene, tetralin 1,2,3,4_; aliphatic hydrocarbons such as n-hexyl burning, n-octane, cyclohexane and the like; halogenated hydrocarbons, such as methylene chloride, chloroform, chlorobenzene and the like; nitro compounds such as nitromethane burning, nitrobenzene and the like; urea (carbamide), such as N, N- dimethylformamide, N, N- dimethylacetamide, N- methylpyrrolidone and the like; ureas such as N, N- dimethyl imidazolidinone; sulfones, such as dimethyl sulfoxide and the like; sulfoxides, such as dimethyl sulfoxide and the like; lactones, such as butyrolactone, caprolactone and the like; carbonates, such as dimethyl carbonate, ethylene carbonate and the like. 使用时，共溶剂的用量可为基于反应组合物总量的约0. 5wt%到约20wt%，在一些实施方案中约0. 8«〖％到约IOwt%，在一些实施方案中约lwt%到约5wt%。  When used, the amount of co-solvent may be from about 0. 5wt% based to about 20wt% of the total reaction composition, in some embodiments from about 0.8 «[% to about IOwt%, in some embodiments, from about lwt% to about 5wt%. 然而应当理解的是，助溶剂并非必须的。 However, it should be appreciated that the co-solvent is not necessary. 实际上，在本发明的一些实施方案中，反应组合物中基本上不合任何助溶剂，例如，低于反应组合物的约0. 5wt%。 Indeed, in some embodiments of the invention, the reaction composition is substantially free of any co-solvent, e.g., less than about 0. 5wt% of the reaction composition. 当然可能为了各种不同原因使用其他配料。  Of course, possible to use a variety of different reasons other ingredients. 例如，在本发明一些实施方案中可能使用湿润剂提高亲水性。 For example, in some embodiments of the present invention may be used in the wetting agent to improve hydrophilicity. 本发明中适用的湿润剂通常与脂肪族-芳香族共聚多酯相容。 The present invention is generally applicable wetting agent and an aliphatic - aromatic copolyester compatible. 适用的湿润剂例子可包括表面活性剂，如UNITHOX ® 480和UNITHOX ® 750乙氧基化的醇，或UNICID™酰胺乙氧基化物，皆可从Tulsa, Okla的Petrolite Corporation获得。 Examples of suitable wetting agents may include surfactants, such as UNITHOX ® 480 and UNITHOX ® 750 ethoxylated alcohols, or UNICID ™ acid amide ethoxylates, can be obtained from Tulsa, Okla of Petrolite Corporation. 其他适用湿润剂描述于Tsai等的美国专利No. 6，177，193中，其出于所有关联目地以全文引用的方式引入本文作为参考。 Other suitable wetting agents are described in U.S. Pat. Tsai et No. 6,177,193, which is associated for all purposes to be incorporated herein by reference in their entirety by reference. 另外其他可能使用的材料不加限制地包括，熔融稳定剂，加工稳定齐IJ，热稳定剂，光稳定剂，抗氧化剂，颜料，表面活性剂，腊，流动性促进剂，增塑剂，微粒，及添加以增强可处理性的其他材料。 Still other materials that may be used include, without limitation, melt stabilizers, processing stabilizers together IJ, heat stabilizers, light stabilizers, antioxidants, pigments, surfactants, waxes, flow promoters, plasticizers, microparticles , and was added to enhance processability of other materials. 使用时，这些额外的成分通常分别以基于脂肪族-芳香族共聚多酯起始聚合物重量的小于约5%的量存在，在一些实施方案中小于约1%，在一些实施方案中小于约O. 5%。 When used, these additional ingredients are generally based on aliphatic - aromatic copolyester amount by weight of the starting polymer is present in less than about 5%, less than about 1%, in some embodiments, less than about, in some embodiments O. 5%. 所述醇解反应可通过任意各种已知技术进行。  The alcoholysis reaction may be carried out by any of various known techniques. 例如在一个实施方案中，所述反应在起始聚合物处于熔融状态（“熔体混合”）时进行，以最小化对额外溶剂和/或溶剂去除方法的需要。 For example, in one embodiment, the reaction is performed starting polymer in a molten state when ( "melt mixing"), to minimize the need for a method for removing additional solvent and / or solvent. 原料（如生物可降解聚合物，醇，催化剂等）可能分别或组合（例如，在溶液中）提供。 Material (e.g., biodegradable polymer, alcohol, catalyst, etc.) may be separately or in combination (e.g., in solution) provided. 同样地，所述原料可同时或顺序加入分散地混合材料的熔体混合设备。 Likewise, the feedstock may be simultaneously or sequentially added to the melt mixing device mixing the dispersion material. 可采用间歇和/或连续熔体混合技术。 Use intermittent and / or continuous melt mixing techniques. 例如，搅拌器/捏和机，班伯里密炼机，Farrel连续搅拌器，单螺杆挤出机，双螺杆挤出机，轧制机等可用于混合所述材料。 For example, a stirrer / kneader, Banbury mixer, a Farrel continuous mixer, single-screw extruder, a twin screw extruder, roll mill, etc. may be used to mix the material. 一个特别适用的熔体混合设备是共旋转双螺杆挤出机（例如获自Ramsey, NewJersey 的Werner & Pfleiderer Corporation的ZSK-30双螺杆挤出机）。 One particularly suitable melt mixing device is a co-rotating twin screw extruder (e.g. available from Ramsey, NewJersey of the Werner & Pfleiderer Corporation ZSK-30 twin screw extruder). 该挤出机可能包括进料及排出口，并且提供高强度分布和分散混合，该混合有利于醇解反应。 The extruder may include a feed and a discharge port, and provide high intensity distributive and dispersive mixing, the mixing facilitate the alcoholysis reaction. 原料（如聚合物，醇，催化剂等）也可能通过加料斗加料到挤出机中。 Material (such as a polymer, an alcohol, a catalyst, etc.) may also be added through a hopper into the extruder. 所述原料可能采用任何常规技术以任何状态提供到进料斗中。 The starting material may be any conventional techniques to provide any state to the feed hopper. 例如，醇可以蒸汽或液态提供。 For example, steam or a liquid alcohol may be provided. 可选地，脂肪族-芳香族共聚多酯可加入加料斗，而醇和任选的催化剂（组合地或分开地）注入到在加料斗下游的挤出机中共聚多酯熔体中。 Alternatively, the aliphatic - aromatic copolyester can Jia Rujia hopper, alcohol and optional catalyst and (in combination or separately) into the copolyester melt in the extruder downstream of the hopper. 不管所选的具体熔体混合技术如何，原料在高剪切/压强及加热下混合，以确保充分混合以引发醇解反应。  Regardless of how the technology, the raw material in a high shear / pressure and heat with mixing to ensure adequate mixing to initiate the selected particular melt mixing alcoholysis reaction. 例如，熔体混合可能在约50°C到约300°C的温度下发生，在一些实施方案中为约70°C到约250°C，在一些实施方案中为约90°C到约220°C。 For example, the melt may be mixed at a temperature of about to 300 ° C occurs at about 50 ° C, in some embodiments, from about 70 ° C to about 250 ° C, in some embodiments, from about 90 ° C to about 220 ° C. 同样地，熔体混合过程中的表观剪切速率可为约IOOiT1到10，ΟΟΟίΓ1，在一些实施方案中为从约δΟΟίΓ1到约5，0008_1，在一些实施方案中为约8008_1到约1,200s'表观剪切速率等于4Q/Ji R3，其中Q为聚合物熔体的体积流速（“m3/s”)，R为熔融聚合物流过的毛细管（例如挤出机模头）的直径(“m”）。 Likewise, during the melt blending may be apparent shear rate from about IOOiT1 to 10, ΟΟΟίΓ1, in some embodiments from about to about 5,0008_1 δΟΟίΓ1, in some embodiments, from about 8008_1 to about 1,200s 'the apparent shear rate is equal to 4Q / Ji R3, wherein Q is a polymer melt volume flow rate ( "m3 / s"), R is the capillary (e.g., extruder die) the molten polymer flows diameter ( " m "). 任意的各种已知技术可能用于形成按照本发明的基本连续的纤丝。  any of a variety of known techniques may be used to form a substantially continuous filaments according to the invention. 改性的脂肪族-芳香族共聚多酯可首先形成，而后进料到制纤丝生产线中的挤出机中（例如纺丝流程中的挤出机12)。 Modified aliphatic - aromatic copolyester may first be formed, and the backward expected line filament prepared in an extruder (e.g. extruder spinning process 12). 可选地，改性的脂肪族-芳香族共聚物可直接形成纤丝。 Alternatively, the modified aliphatic - aromatic copolymer filaments may be formed directly. 参考图1，例如，显示了形成按照本发明的基本上连续的纤丝的方法10的一个实施方案。 Referring to FIG 1, for example, it shows a form of embodiment according to the present invention substantially continuous filaments 10 of the method. 如图示，设置该实施方案的方法10以制备双组分连续纤丝纤网，尽管应当理解其他实施方案也是本发明所预期的。 As illustrated, this embodiment is provided a method 10 to prepare a two-component continuous filaments webs, although it should be understood that other embodiments of the present invention are also contemplated. 所述方法10采用一对挤出机12a和12b以分别挤出第一组分A(例如，高熔点聚合物组分）及第二组分B (例如，低熔点聚合物组分）。 The process 10 employs a pair of extruders 12a and 12b are respectively extruded first component A (e.g., high melting point polymer component) and a second component B (e.g., low melting point polymer component). 组分A和B的相对量通常可基于期待的性质而变化。 The relative amounts of the components A and B may generally vary based on the expected properties. 例如，第一组分A通常占多组分纤丝的约5«丨％到约95wt%，在一些实施方案中为约10wt%到90wt%,在一些实施方案中为约15wt%到85wt%。 For example, the first component A multicomponent filaments generally comprise from about 5 «Shu% to about 95 wt%, in some embodiments, from about 10wt% to 90 wt%, in some embodiments, from about 15wt% to 85wt% . 同样地,第二组分B通常占多组分纤丝的约5wt%到约95wt%,在一些实施方案中为约IOwt %到90wt%,在一些实施方案中为约15«七％到85wt%。 Similarly, the second component B typically comprises about 5wt% of the multicomponent filaments to about 95wt%, in some embodiments, from about IOwt% to 90wt%, in some embodiments, from about 15 «seven% to 85wt %. 第一组分A从第一加料斗14a进料到相应的挤出机12a，第二组分B从第二加料斗14b进料到其挤出机12b。  The first component A from a first hopper 14a fed into the respective extruder 12a, a second component B from a second hopper 14b which is fed into the extruder 12b. 组分A和B从挤出机12a和12b (共挤出）通过对应的聚合物导管16a和16b给料到喷丝头18。 Components A and B from the extruders 12a and 12b (co-extrusion) through a corresponding polymer conduits 16a and 16b to a spinneret 18 is fed. 用于挤出多组分纤丝的喷丝头为本领域技术人员所公知。 Spinneret for extruding multicomponent filaments are known to those skilled in the art. 例如，所述喷丝头18可包括外罩,外罩包括纺丝组合（spin pack),纺丝组合具有多个彼此堆叠的板，并具有开口图案（a pattern of openings),该开口图案被设置成形成引导聚合物组分A和B分别穿过喷丝头18的流动路径。 For example, the spinneret 18 may include a housing, the housing comprising a combination of spin (spin pack), a spinning plate having a combination of a plurality of stacked on each other, and having an opening pattern (a pattern of openings), the opening pattern is provided guide formed polymer component a and B are a flow path through the nozzle head 18. 所述喷纤丝头18也具有排成一排或多排的开口。 The spray head 18 also having filaments aligned in one or more rows of openings. 当聚合物通过其挤出时，所述开口形成向下挤出的纤丝帘。 When the polymer is extruded through the opening is formed downwardly extruded filament curtain. 该喷纤丝头18可被设置成形成鞘/核型，边靠边型，馅饼型构型，或其他构型。 The filaments jet head 18 may be arranged to form a sheath / core type, side by side type, a pie type configuration, or other configurations. 方法10也使用置于靠近从喷丝头18延伸出的纤丝帘的快冷风机20。  Method 10 may also use the fast cooling fan disposed near the curtain of filaments extending from the spinneret 18 to 20. 来自快冷空气风机20的空气骤冷从喷丝头18延伸出的纤丝。 Fast cool air from the quench blower 20 of filaments extending from the spinneret 18. 冷却空气可能来自纤丝帘的一边，如图I 所示，或纤丝帘的两边。 The cooling air can come from one side of the filament curtain as shown in FIG. I, or both sides of the filament curtain. 拉丝单元或吸气器（aspirator) 22置于喷丝头18下方，并接收冷却的纤丝。 Wire drawing unit or aspirator (aspirator) 22 disposed below the spinneret 18 and receives the cooled filaments. 用于熔融纺织聚合物的拉丝单元或吸气器为本领域公知。 Molten polymer for textile drawing unit or aspirator known in the art. 在本发明的方法中适用的拉丝单元包括美国专利No. 3，802, 817及3，423，255中所示类型的线性纤维吸气器，将其出于所有有关目的以全文引用的方式结合于本文。 Applicable in the methods of the present invention comprises a wire drawing unit U.S. Patent No. 3,802, 817 and 3,423,255 the type shown in linear fiber aspirators, which for all relevant purposes incorporated by reference in its entirety herein. 拉丝单元22通常包括延长竖直通道，通过该通道纤丝被从通道端部进入并沿着通道向下流动的吸入空气（aspirating air)所拉伸。 Drawing unit typically includes an elongated vertical channel 22, and is sucked into the downward flow of air along the channel (aspirating air) from the drawn channel ends through which the filaments. 加热器或吹风机24为拉丝单元22提供吸入空气。 Heater or blower 24 supplies air to the intake drawing unit 22. 吸入空气驱动纤丝及周围的空气通过拉丝单元22。 The intake air and the air surrounding the filament driving unit 22 by wire drawing. 此后，通过将纤丝随机堆积到形成面26上（任选用真空辅助）并将形成的纤网用任何已知技术黏结，所述纤丝被制成粘结纤网（coherent web)结构。 Thereafter, the web filaments by randomly deposited onto the forming surface 26 (optionally with vacuum assist) and formed by bonding any known technique, said filaments being a bonded web (coherent web) structure. 随着挤出的纤丝在喷丝头下方延伸，来自快冷风机20的空气流至少部分骤冷所述纤丝。  As the extruded filaments extend below the spinneret, the air flow from faster cooling fan 20 at least partially quench the filaments. 这种过程一般在相对短时间范围内（数秒）降低挤出的聚合物的温度至少约100°C。 This process is generally in the range of a relatively short time (a few seconds) to reduce the temperature of the extruded polymer is at least about 100 ° C. 这一般会降低冷却时所需的温度变化，到优选为低于150°c，并在一些情况下低于100°C。 This will generally reduce the temperature change needed upon cooling, to preferably less than 150 ° c, less than 100 ° C and in some cases. 本发明使用相对低的挤出机温度的能力也允许使用更低的骤冷温度。 The ability to use relatively low extruder temperature in the present invention also allows the use of lower quenching temperatures. 例如，快冷风机20可采用在约200C到约1000C的温度下操作的一个或多个区间，在一些实施方案中为约25°C到约60°C。 For example, one or more sections of fast cooling fan 20 can be operated at a temperature of from about 200C to about 1000C, and in some embodiments from about 25 ° C to about 60 ° C. 冷却后，纤丝被来自加热器或风机22并穿过拉丝单元的气流如空气拉伸进入拉丝单元22的垂直通道中。 After cooling, the filaments from the heater or blower 22 through the wire drawing unit and air-flow into the vertical passage tensile wire drawing unit 22. 所述气流导致纤丝的拉伸或变细，这增长其分子趋向度或组成纤丝的聚合物的结晶度。 The flow results in thinning or stretching filaments, which tends to increase its molecular degree of crystallinity of the polymer or composition of the filaments. 所述纤丝通过拉丝单元22出口开口沉积到多孔的表面26上。 The filaments are deposited on the surface of the porous wire drawing unit 26 through the outlet opening 22. 由于本发明的纤丝的高强度，在本发明中可采用高拉伸比（例如多孔表面26的线速度除以挤出机12a和12b的熔体泵出速率）。 Due to the high strength of the filaments of the present invention may be employed in the present invention, a high draw ratio (e.g. porous surface 26 divided by the line speed of the extruders 12a and 12b of the melt pump out rate). 例如，拉伸比可为约200 ： I到约6000 ： 1，在一些实施方案中约500 ： I到约5000 ： 1，在一些实施方案中约1000 ： I到约4000 ： I。 For example, the stretching ratio may be from about 200: I to about 6000: 1, in some embodiments, from about 500: I to about 5000: 1, in some embodiments, from about 1000: I to about 4000: I. 所述纤丝期待的旦数（denier)可取决于期待应用而变化。  The expected denier filaments (denier) may vary depending on the expected application. 典型地，通常形成每根纤丝旦数少于约6的纤丝，在一些实施方案中小于约3，在一些实施方案中为约O. 5到约3。 Typically, each usually formed of filaments of less than about 6 denier filaments, less than about 3, in some embodiments, in some embodiments, from about 3 to about O. 5. 此外，所述纤丝通常具有不大于约100微米的平均直径，在一些实施方案中为约O. 5微米到约50微米，在一些实施方案中为约4微米到40微米。 In addition, the filaments generally have an average diameter no greater than about 100 microns, in some embodiments, from about O. 5 microns to about 50 microns, in some embodiments, from about 4 to 40 microns. 生产这种纤丝的能力在本发明中可以通过使用具有低表观粘度和高熔体流动指数的期望组合的改性共聚多酯而促进。 Modified ability to produce such filaments in the present invention may have low apparent viscosity and a high melt flow index by using a combination of the desired copolyester is promoted. 如果需要的话，可在拉丝单元22的下方放置循环的多孔形成面26并接收来自出口的开口的纤丝。  If desired, a porous forming surface may be placed below the loop 26 of the wire drawing unit 22 and receives the filaments from the outlet opening. 形成面26绕着导辊28运行。 Surface 26 is formed around the guide rollers 28 run. 真空30置于形成面26下方以将纤丝拉向形成面26，并加强未黏合的无纺纤网。 26 is placed below the vacuum forming surface 30 to form the fiber strands to the surface 26, and to strengthen unbonded nonwoven web. 该纤网可随后被压紧辊32压紧。 The web 32 may then be pressed against the pinch roller. 一旦形成，该无纺纤网可能采用任何常规技术黏合，例如使用粘合剂或自发黏合（例如纤丝在无外加粘合剂下的熔合和/或自粘）。 Once formed, the nonwoven web may be by any conventional bonding technique, for example using an adhesive or self-adhesive (e.g., filaments fused without additional adhesive and / or self-adhesive). 自发黏合，例如，可在纤丝为半熔融或粘的时，通过纤丝的接触来实现，或简单地通过将粘性树脂和/或溶剂与用于形成纤丝的脂肪族聚酯来实现。 Self-adhesive, for example, when the semi-molten or tacky, is achieved by contacting the filaments in the filament, or simply a tackifying resin and / or solvent to achieve for forming aliphatic polyester filaments through. 合适的自发黏合技术可包括超声黏合，热黏合，热风黏合（through-air bonding)等。 Suitable techniques may include ultrasonic bonding self adhesive, heat bonding, hot air bonding (through-air bonding) and the like. 在图I中，例如，纤网在缠绕到辊42上之前首先通过一对辊34之间形成的夹。  In Figure I, for example, before the web is wound onto a first roller 42 interposed between a pair of rollers 34 is formed by. 可以加热棍34中的一个或两个以将纤丝融合和/或具有间歇凸起的黏合点（raised bondpoint)以提供间断黏合的图样。 34 may be heated in a stick or two fused to filaments and / or adhesive having a pattern of points (raised bondpoint) to provide intermittent protrusions of bonding discontinuity. 可以选择凸起点的图样，以使所述无纺纤网的总黏合面积小于约50% (由常规光学显微方法确定），在一些实施方案中，少于30%。 Convex pattern may be selected points, so that the total bonding area of ​​the nonwoven web is less than about 50% (as determined by conventional optical microscopic methods), in some embodiments, less than 30%. 同样地，黏合密度也通常大于每平方英寸约100处黏合，在一些实施方案中为每平方英寸约250到约500处针黏合（pin bond)。 Similarly, the bonding density is typically greater than about 100 per square inch of adhesive, in some embodiments, from about 250 per square inch to about 500 at the needle tacking (pin bond). 该总黏合面积和黏合密度的结合可通过用针黏合图样粘合纤网而实现，所述图样具有每平方英寸超过100处针黏合，当与光滑支承辊完全接触时，该图样可提供小于30%的总黏合表面积。 The total binding of the adhesive bonding area and density can be needle bonded web bonding pattern is achieved by having the pattern 100 per square inch than the bonding needle, when fully contacting a smooth anvil roll, which may provide a pattern of less than 30 % of total bonding surface area. 在一些实施方案中，所述黏合图样可具有每平方英寸约250到约350处针黏合的针黏合密度，并且当与光滑支承辊接触时，具有约10%到约25%的总黏合表面积。 In some embodiments, the adhesive may have a pattern of about 250 per square inch to about 350 at a bonding needle tacking needle density, and when contacted with a smooth anvil roll, having about 10% to about 25% of the total surface area of ​​the adhesive. 不例性的黏合图样包括，例如描述于Hansen等人的美国专利No. 3, 855, 046,Levy等人的美国专利No. 5, 620, 779, Haynes等人的美国专利No. 5, 962, 112, Sayovitz等人的美国专利No. 6，093, 665，Romano等人的美国外观专利No. 428，267，Brown的美国外观专利No. 390，708中的那些，其出于所有目的以全文引用的方式引入作为参考。 Examples of adhesive pattern does not include, for example, as described in Hansen et al., U.S. Pat. No. 3, 855, 046, Levy et al., U.S. Pat. No. 5, 620, 779, Haynes et al., U.S. Pat. No. 5, 962 , 112, Sayovitz et al., U.S. Patent No. 6,093, 665, Romano et al., U.S. Design Patent No. 428,267, Brown U.S. Design Patent No. 390,708 to those in which for all purposes way entirety by reference incorporated herein by reference. 由于用于形成多组分纤丝的成分的特殊流变学和热性质，可以选择纤网黏合条件(例如，温度和夹压力）以导致低熔点的改性共聚多酯融化流动而基本上不融化高熔点聚酯。  used for forming the particular rheological and thermal properties of the components of multicomponent filaments, the web bonding conditions may be selected (e.g., temperature and pressure clips) to cause the low melting point modified copolyester melt flow substantially without melting the high melting point polyester. 例如，黏合温度（例如辊34的温度）可为约50°C到约160°C，在一些实施方案中从约80°C到约160°C，在一些实施方案中约100°C到约140°C。 For example, bonding temperature (e.g. a temperature of roller 34) may be about 160 ° C to about 50 ° C, in some embodiments from about 80 ° C to about 160 ° C, in some embodiments, from about 100 ° C to about 140 ° C. 同样地，夹压力可为约5到150磅每平方英寸，在一些实施方案中为约10到100磅每平方英寸，在一些实施方案中为约30到60磅每平方英寸。 Similarly, the clamping force may be from about 5 to 150 lbs per square inch, in some embodiments, from about 10 to 100 lbs per square inch, in some embodiments about 30 to about 60 pounds per square inch. 当以此方式黏合时，低熔点改性共聚多酯可因此在压紧的区域内形成基质，其基本上包围着高熔点聚合物。  In this manner, when bonding, the low melting point modified copolyester may thus form a matrix within the compacted area that substantially surrounds the high melting point polymer. 由于高熔点聚合物基本上不融化，然而其保持基本上纤维的形式。 Since the high melting point polymer does not substantially melt, however, it remains substantially in the form of fibers. 由于纤丝以随机方式堆积，高熔点聚合物同时也通常在压紧区域内在一个或两个方向上取向。 Since the accumulation of the filaments in a random manner, generally high melting point polymer is also inherent in the pressing region of one or two orientation directions. 一种聚合物，例如，相对于压紧区域中的另一种聚合物，可能从60°到约120°取向，在一些情况下为约90°。 A polymer, e.g., with respect to the pressing region of another polymer, may range from about 60 ° to 120 ° orientation, and in some cases about 90 °. 通过这种方式，高熔点聚合物可赋予生成的纤网增强的强度和韧度。 In this manner, the high melting point polymer may impart enhanced web strength and toughness generated. 例如，该无纺纤网可显示出相对高的“峰值负荷”，该量表示断裂的最大负荷，以克力每英寸为单位来表示。 For example, the nonwoven web may exhibit a relatively high "peak load", which represents the maximum amount of load break, expressed in units of grams-force per inch. 所述纤网的MD峰值负荷可为，例如至少约3000克力每英寸（“gf/in”)，在一些实施方案中为至少约3500gf/in，在一些实施方案中为至少约4000gf/in。 The MD peak load of the web may be, for example, at least about 3000 grams-force per inch ( "gf / in"), in some embodiments, at least about 3500gf / in, in some embodiments, at least about 4000gf / in . CD峰、值负荷也可能为至少约1200克力每英寸（“gf/in”），在一些实施方案中为至少约1500gf/in，在一些实施方案中为至少约2500gf/in。 CD peak value of the load may be at least about 1200 grams-force per inch ( "gf / in"), it is at least about 1500gf / in] In some embodiments, in some embodiments, at least about 2500gf / in. 除了对纤网的总体强度做出贡献，所选择的黏合条件也可提高纤网的其他机械性质。  In addition to contributing to the overall strength of the web, bonding the selected condition can also improve other mechanical properties of the web. 例如，尽管在压紧区域内保持了其纤维结构，在施加张力时，高熔点聚合物从压紧区域中自然释放或分离，而不是破碎。 For example, although retaining its fiber structure in the pressing region, when tension is applied, the high melting point polymer is released or isolated from natural pinched regions, rather than broken. 通过在张力下释放，甚至在所述纤网显示出相当的延长后，该聚合物可继续作为负载承受元件起作用。 After releasing under tension by, show comparable or even extended in the web, the polymer may continue to function as a load bearing element. 在这点上，所述无纺纤网能显示出提高的“峰值延长”性能，即，在峰值负荷下纤网延长的百分比。 In this regard, the nonwoven web can exhibit improved "peak extension" performance, i.e., the peak load in percentage extension of the web. 例如，所述无纺纤网可显示出至少约10%的纵向（machine direction) ( “MD”）峰值延长,在一些实施方案中至少约20%，在一些实施方案中至少约35%。 For example, the nonwoven web may exhibit at least about 10% of the longitudinal (machine direction) ( "MD") peak extended, in some embodiments at least about 20%, in some embodiments at least about 35%. 所述无纺纤网也可显示出至少约35%的横向(cross-machine direction)( “⑶”）峰值延长，在一些实施方案中至少约45%,在一些实施方案中至少约50%。 The nonwoven web may also exhibit at least about 35% of the transverse (cross-machine direction) ( "⑶") peak extension, at least about 45%, in some embodiments, in some embodiments at least about 50%. 当然，除了具有良好机械性质，所述无纺纤网也柔软，适于悬垂，有触感。 Of course, in addition to good mechanical properties, the nonwoven web also soft, suitable drape, tactile. 进一步地，所述无纺纤网具有良好的吸水性质，这促进了其用于吸收产品的能力。 Further, the nonwoven web has a good absorbent properties, which facilitates its ability for absorbing the product. 本发明的纤丝可能构成所述无纺纤网的全部纤维成分，或与其他类型的纤维混合（例如，常产纤维，连续纤维等）。 Filaments  The present invention may constitute the entire fibrous component of the nonwoven web, or mixed with other types of fibers (e.g., staple fibers, continuous fibers, etc.). 当与其他类型的纤维混合时，自然地期望本发明的纤丝占所述无纺纤网中所使用的纤维总量的约20wt%到约95wt%，在一些实施方案中为约30wt%到约90wt%,在一些实施方案中为约40wt%到约80wt%。 When mixed with other types of fibers, filaments desirable naturally present invention comprises from about 20wt% to about 95wt% of the total amount of the nonwoven web used in the fiber, in some embodiments, from about 30wt% to about 90wt%, in some embodiments, from about 40wt% to about 80wt%. 例如,额外的单组分和/或多组分合成纤维可能用在所述无纺纤网中。 For example, additional monocomponent and / or multicomponent synthetic fibers may be used in the nonwoven web. 一些可用于形成合成纤维的合适的聚合物包括但不限于：聚烯烃，例如聚乙烯，聚丙烯，聚丁烯等；聚四氟乙烯；聚酯，例如聚对苯二甲酸乙二酯等；聚乙酸乙烯酯；聚氯乙烯-乙酸乙烯酯；聚乙烯醇缩丁醛；丙烯酸类树脂，例如聚丙烯酸酯，聚丙烯酸甲酯，聚甲基丙烯酸甲酯等；聚酰胺，如尼龙等；聚氯乙烯；聚偏二氯乙烯；聚苯乙烯；聚乙烯醇；聚氨酯；聚乳酸等。 Some suitable synthetic fibers can be used to form polymers include, but are not limited to: polyolefins, such as polyethylene, polypropylene, polybutylene and the like; polytetrafluoroethylene; polyesters such as polyethylene terephthalate and the like; polyvinyl acetate; polyvinyl chloride - vinyl acetate; polyvinyl butyral; acrylic resins, such as polyacrylates, polymethyl acrylate, polymethyl methacrylate and the like; polyamides, such as nylon and the like; poly chloride; polyvinylidene chloride; polystyrene; polyvinyl alcohols; polyurethanes; polylactic acid and the like. 如果期望的话，生物可降解聚合物如聚乙醇酸（PGA)，聚乳酸（PLA)，聚β -苹果酸（PMLA)，聚ε -己酸内酯（PCL)，聚P -对二氧杂环己酮（poly(p-dioxanone)) (PDS),聚琥拍酸丁二酯（PBS)以及聚3-轻基丁酸酯（PHB)也可使用。 If desired, biodegradable polymers such as polyglycolic acid (PGA), polylactic acid (PLA), poly-β - malic acid (PMLA), poly-ε - polycaprolactone (PCL), poly-P - on dioxa cyclohexanone (poly (p-dioxanone)) (PDS), poly butylene succinate shoot acid ester (PBS) and poly 3 light butyrate (PHB) can also be used. 已知的一些合成纤维的例子包括可购于Charlotte, North Carolina的KoSaInc.的商品名为T-255和T-256的鞘-核双组分纤维，其均使用聚烯烃鞘，或者T-254，其使用具有低熔点共聚多酯鞘。 Some examples of known synthetic fibers include those available in Charlotte, North Carolina sheath of KoSaInc trade name T-255 and T-256 - the core bicomponent fibers, which are a polyolefin sheath, or T-254 , which having a low melting point copolyester sheath. 其他已知可使用的双组分纤维包括可购于Moriyama, Japan的Chisso Corporation,或Wilmington, Delaware 的Fibervisions LLC 的那些。 Other bicomponent fibers can be used include known available from Moriyama, Japan's Chisso Corporation, or Wilmington, Delaware, those of Fibervisions LLC. 也可能使用合成或天然纤维素聚合物，包括但不限于，纤维素酯，纤维素醚，硝酸纤维素，醋酸纤维素（cellulosic acetate)乙酸酯，乙酸丁酸纤维素（cellulosic acetate butyrate),乙基纤维素（ethylcellulose)，再生纤维素如纤维胶，人造纤维等。 Also possible to use synthetic or natural cellulosic polymers, including but not limited to, cellulose esters, cellulose ethers, cellulose nitrate, cellulose acetate (cellulosic acetate) acetate, cellulose acetate butyrate (cellulosic acetate butyrate), ethylcellulose (ethylcellulose), regenerated cellulose such as viscose, rayon and the like. 本发明的纤丝也可能与木浆纤维混合，例如高平均纤维长度木浆，低平均纤维长度木浆或其混合物。  The filaments of the present invention may also be mixed with pulp fibers, such as high-average fiber length pulp, low-average fiber length pulp, or mixtures thereof. 适用的高平均纤维长度绒毛木浆纤维的一个例子包括软木牛皮纸木浆纤维。 One example of high-average fiber length fluff pulp fibers includes softwood kraft of suitable wood pulp fibers. 软木牛皮纸木浆纤维为从松柏科树木得到并包括但不限于如下木浆纤维：北部，西部，和南部软木种，包括红木，红杉（red cedar),铁杉,花旗松,冷杉（true firs),松（例如南方松），云杉（例如黑云杉），及其组合等。 Softwood kraft pulp fibers obtained from coniferous trees and include, but are not limited to, wood pulp fibers: north, west, and south of softwood species, including redwood, red cedar (red cedar), hemlock, Douglas fir, fir (true firs ), pine (e.g., southern pine), spruce (e.g., black spruce), combinations thereof and the like. 北方软木牛皮纸木浆纤维可用于本发明中。 Northern softwood kraft pulp fibers may be used in the present invention. 适用于本发明的可商购的南方软木牛皮纸木浆纤维的一个例子包括可购于办公地址在Federal Way, Washington 的Weyerhaeuser Company 的商品名为NB-416 的那些。 Applicable to the present invention is an example of southern softwood kraft pulp fibers commercially available include those available to the office address those in the NB-416 Federal Way, Washington under the trade name of Weyerhaeuser Company. 另一个适于本发明使用的木浆为漂白的硫酸盐木浆，其主要含有可购于办公地址在Greenville，South Carolina的Bowater Corp.的商品名为CoosAbsorb S pulp的软木纤维。 Another suitable for use in the invention is pulp bleached sulphate wood pulp containing primarily soft wood fibers which are commercially available in the office address in Greenville, South Carolina under the tradename of Bowater Corp. of CoosAbsorb S pulp. 低平均长度纤维也可用于本发明中。 Low average fiber length can also be used in the present invention. 合适的低平均长度木浆纤维的例子为硬木牛皮纸木浆纤维。 Examples of suitable low-average length pulp fibers is hardwood kraft pulp fibers. 硬木牛皮纸木浆纤维产自落叶树木，包括但不限于如下木浆纤维：桉树，枫树，桦树，山杨等。 Hardwood kraft wood pulp fibers produced from deciduous trees, including but not limited to wood pulp fibers: as eucalyptus, maple, birch, aspen and the like. 桉树牛皮纸木浆纤维可为尤其期望的，以增加柔软度，增强亮度，增加不透明度，改变片材的孔结构以增强其芯吸能力。 Eucalyptus kraft pulp fibers may be particularly desired to increase softness, enhance the brightness, increase the opacity, change the pore structure of the sheet to increase its wicking ability. 也可制备无纺层压材料，其中的一层或多层由本发明的多组分纤维形成。  The nonwoven laminate may also be prepared, wherein one or more layers formed of multicomponent fibers of the present invention. 在一个实施方案中，例如，无纺层压材料包括位于两个纺粘层之间的熔喷层，以形成纺粘/熔喷/纺粘（“SMS”）层压材料。 In one embodiment, for example, a nonwoven laminate comprising a meltblown layer positioned between two spunbond layers to form a spunbond / meltblown / spunbond ( "SMS") laminate. 当需要时，可用本发明的纤丝制成一个或多个纺粘层。 When desired, the present invention is made of one or more filaments spunbond layer. 熔喷层可由改性共聚多酯，其他生物可降解的聚合物和/或其他聚合物（例如聚烯烃）制成。 Meltblown layer may be modified copolyester, other biodegradable polymers and / or other polymers (e.g., polyolefins) is made. 各种制备SMS层压材料的技术描述于Brock等人的美国专利No. 4，041, 203, Timmons等人的No. 5, 213, 881, Timmons 等人的No. 5, 464, 688, Bornslaeger 等人的No. 4, 374, 888, Collier等人的No. 5, 169, 706, Brock等人的No. 4, 766, 029,以及Fitting等人的美国专利申请公开No. 2004/0002273，其出于所有目地以全文引用的方式结合于本文作为参考。 Various preparation techniques SMS laminates are described in Brock et al., U.S. Patent No. 4,041, 203, Timmons et al No. 5, 213, 881, Timmons et al No. 5, 464, 688, Bornslaeger et al., No. 4, 374, 888, Collier et al., No. 5, 169, 706, Brock et al., No. 4, 766, 029, and Fitting et al, US Patent application Publication No. 2004/0002273, which for all purposes to be incorporated by reference in their entirety herein by reference. 当然，所述无纺层压材料可具有其他构型并具有任意期望层数的熔喷及纺粘层，例如纺粘/熔喷/熔喷/纺粘层压材料（“3匪3”），纺粘/熔喷层压材料（“SM”）等。 Of course, the nonwoven laminate may have other configurations and have any desired number of layers of meltblown and spunbond layers, such as spunbond / meltblown / meltblown / spunbond laminate ( "3 3 bandit") , spunbond / meltblown laminates ( "SM") and the like. 尽管无纺层压材料的基重可能根据期待的应用而改变，其通常为约10到约300克每平方米（“gsm”)，在一些实施方案中为约25到约200gsm，在一些实施方案中为约40到约150gsm。 Although the basis weight of the nonwoven laminate may vary depending on the expected application, which is generally ( "gsm"), in some embodiments, from about 25 to about 200 gsm, in some embodiments from about 10 to about 300 grams per square meter embodiment from about 40 to about 150gsm. 如果期望，所述无纺纤网或层压材料可被施加不同处理以赋予合意的性质。  If desired, the nonwoven web or laminate can be applied to different treatment to impart desirable properties. 例如，所述纤网可用抗液添加剂，抗静电剂，表面活性剂，着色剂，防雾剂，氟化物抗血或抗醇齐U，润滑剂，和/或抗微生物试剂处理。 For example, the web available liquid repellent additive, an antistatic agent, a surfactant, a colorant, antifogging agent, a fluoride or an anti-anti-blood alcohol homogeneous U, lubricants, and / or antimicrobial reagent. 此外，所述纤网可进行驻极体处理，以使其带上静电以改进其滤过效率。 Furthermore, the web may be electret treatment, so as to bring the electrostatic filtration to improve its efficiency. 该电荷可能包括截留于聚合物表面上或附近的正电或负电层，或在聚合物主体内储存的电荷云。 The trapped charge on the polymer may include or near the surface layer of positively or negatively charged, or stored in a charge cloud within the polymer body. 所述电荷也可能包括冻结于分子的偶极队列中的极化电荷。 The charge may also include a freeze queue molecular dipole polarization charges. 使织物经受驻极体处理的方法是本领域内技术人员公知的。 The fabric is subjected to electret treatment is a method known to those skilled in the art. 这种方法的例子包括但不限于如热技术，液体接触技术，电子束技术，以及电晕放电技术。 Examples of such methods include, but are not limited to, techniques such as thermal, liquid-contact techniques, electron beam techniques, as well as corona discharge techniques. 在一个具体的实施方案中，驻极体处理为电晕放电技术，其涉及使层压材料经受一对电场的处理，其中所述电场具有相反的极性。 In a specific embodiment, the electret treatment is a corona discharge technique, which involves subjecting the laminate to process a to the electric field, wherein said electric field having an opposite polarity. 其他用于形成驻极体材料的方法描述于Kubik等人的美国专利No. 4，215，682,Wadsworth 的美国专利4，375，718,Nakao 的美国专利4，592，815 ：Ando 的美国专利4，874，659 :Tsai,等人的美国专利5，401, 446 :Reader等人的美国专利5，883，026 ；Rousseau等人的美国专利5, 908, 598 :Knight等人的美国专利6, 365，088，其出于所有目地以全文引入作为参考。 Other methods for forming electret materials are described in Kubik et al., U.S. Pat. No. 4,215,682, Wadsworth U.S. Patent No. 4,375,718, U.S. Patent No. 4,592,815 to Nakao: Ando's U.S. Patent 4,874,659: Tsai, et al., US Patent 5,401, 446: Reader et al., US Patent 5,883,026; Rousseau et al., US Patent 5, 908, 598: Knight, et al., US Patent 6 , 365,088, its entirety for all purposes to be incorporated by reference. 所述无纺纤网或层压材料可用于大范围的各种应用中。  The nonwoven web or laminate may be used for various applications in a wide range. 例如，所述纤网可引入至IJ “医疗产品”，例如罩衣，手术单，面罩，头罩，外科帽，鞋套，杀菌擦拭物，保暖毯，加热衬垫等。 For example, the web may be introduced into the IJ "medical products", such as gowns, surgical drapes, face masks, head coverings, surgical caps, shoe covers, sterilization wipes, thermal blankets, heating pads and the like. 当然，所述无纺纤网也可以用于各种其他用品中。 Of course, the nonwoven web may also be used in various other articles. 例如，所述无纺纤网可引入到“吸收性用品”中，其具有吸水或其他流体的能力。 For example, the nonwoven web may be incorporated into the "absorbent article", it has a water absorption capacity or other fluids. 一些吸收性用品的实例包括但不限于个人护理吸收性用品，例如尿布，训练裤，吸收内裤，失禁用品，女性卫生产品（例如卫生巾），泳装，婴儿擦拭品，手套擦拭品（mitt wipe)等；医疗吸收性用品，包括服装，开窗术材料，护垫(under pad)，床护垫，绷带，吸收性覆盖物以及医用擦拭品；餐饮服务擦拭品；服装用品；袋等。 Examples of some absorbent articles include, but are not limited to, personal care absorbent products such as diapers, training pants, absorbing underwear, incontinence products, feminine hygiene products (such as sanitary napkins), swimwear, baby wipes, gloves, wipers (mitt wipe) and the like; medical absorbent articles, including garments, fenestration materials, pads (under pad), bed pads, bandages, absorbent coverings and medical wipes; food service wipers; clothing articles; bags. 适用于制造这类用品的材料和方法为本领域技术人员所公知的。 Suitable materials and methods of making such articles are well known to those skilled in the art. 吸收性用品，例如，一般包括液体基本不透过层（例如，外罩），液体可透过层（例如身体侧衬垫，内部浪涌层(surge layer)等）以及吸收芯。 Absorbent article, for example, typically substantially comprises a liquid (e.g., bodyside liner, surge layer internal (surge layer), etc.) and an absorbent core permeable layer (e.g., outer cover), a liquid permeable layer. 在一个实施方案中，例如，根据本发明所制成的无纺纤网可用于形成吸收性用品的外罩。 In one embodiment, for example, nonwoven webs made according to the present invention may be used to form the outer cover of the absorbent article. 如果期望，所述无纺纤网可层压到蒸汽可透过或不可透过的液体不透过层上。 If desired, the nonwoven web may be laminated to the liquid-vapor permeable layer permeable or impermeable. 本发明在参考下述实施例的情况下可以更好的被理解。  The present invention may be better understood with reference to the case in the following examples. 得到数均分子质量（MWn)，重均分子质量（MWw)及初始粘均分子量（MWz)。  having a number average molecular weight (MWn), a weight-average molecular weight (MWw) and an initial viscosity average molecular weight (MWz). 聚合物试样的流变学性质通过带有WinRHEO version 2. 31分析软件的GSttfertRheograph 2003 capillary rheometer测定。  The rheological properties of the polymer sample with a 2003 capillary rheometer measurement GSttfertRheograph WinRHEO version 2. 31 by the analysis software. 所述装配包括2000巴压力传感器及30/1:0/180圆孔毛细模头。 The assembly comprises a 2000 bar pressure transducer and a 30/1: 0/180 round hole capillary die. 试样加载通过在试样添加间交替和以推杆推挤完成。 By alternately loading the sample and to push the push rod between the completion of adding the sample. 每个测试前有两分钟的熔融时间以使聚合物在测试温度（通常是160到220°C )下完全熔化。 Melting time of two minutes before each test to allow the polymer at the test temperature (usually 160 to 220 ° C) under completely melted. 所述毛细管流变计在不同剪切速率，如100，200，500，1000，2000及4000s—1下测定表观粘度。 The capillary rheometer at different shear rates, such as measuring the apparent viscosity at 100,200,500,1000,2000 and 4000s-1. 得到的表观剪切速率对表观粘度的流变学曲线显示在挤出过程的温度下聚合物会如何流动。 Apparent shear rate obtained on the apparent viscosity rheological curve shows how the temperature of the polymer will flow under the extrusion process. 熔体流动指数为当经受2160克的负载时，通常在190°C下，在十分钟内强行通过挤出流变计孔（O. 0825英寸直径）的聚合物的重量（以克计）。  The melt flow index when subjected to a load of 2160 grams, typically at 190 ° C, forced through in ten minutes by weight of polymer extrusion rheometer orifice (O. 0825 inch diameter) (in grams meter). 除非另行说明，熔体流动指数按照ASTM测试方法D1238-E测定。 Unless otherwise stated, melt flow index measured according to ASTM Test Method D1238-E.
 熔融温度（“Tm”），玻璃化转变温度（“Tg”）以及融合潜热（“ ΛΗ/'）通过差示扫描量热仪（DSC)测定。所述差示扫描量热仪为THERMALANALYST 2910差示扫描量热仪，其配备有液氮冷却配件以及THERMALANALYST 2200 (version 8. 10)分析软件程序，此二者均可从New Castle, Delaware的TA Instruments Inc.购得。为了避免直接处理试样，使用镊子或其他工具。试样被放置到铝盘上，在分析天平上精确称重到0.01毫克。将盖子将试样压在盘上。典型地，树脂球直接放到称重盘里，而纤维经切割以适应放置在称重盘上，并由盖覆盖。  melting temperature ( "Tm"), a glass transition temperature ( "Tg") and a fusion latent heat ( "ΛΗ / ') (DSC) as measured by a differential scanning calorimeter. The differential scanning calorimeter was THERMALANALYST 2910 differential scanning calorimeter, equipped with a liquid nitrogen cooling accessory and THERMALANALYST 2200 (version 8. 10) analysis software program, both of which are from New Castle, Delaware TA Instruments Inc.'s commercially available. in order to avoid direct treated samples, tweezers or other tools. the samples were placed on an aluminum pan and weighed on an analytical balance accurate to 0.01 mg. the sample was pressed on the cover plate. typically, the resin was weighed directly into the ball plate, and the fiber was cut to accommodate placement on the weighing pan, covered by the cover. 如差示扫描量热仪的操作说明书所述，差示扫描量热仪采用铟金属标准校准，并进行基线校正。  The description of the operation of a differential scanning calorimeter, a differential scanning calorimeter calibrated using an indium metal standard and a baseline correction. 将材料试样放置于用于测试的差示扫描量热仪的测试室中，并使用空盘作为对照。 The material sample was placed in testing for differential scanning calorimetry in the test chamber calorimeter, and an empty pan as a control. 所有的测试都是在用55立方厘米每分钟的氮气（工业级）清洗测试室的条件下完成的。 All tests were done under the cleaning conditions of the test chamber with 55 cubic centimeters per minute nitrogen (industrial grade). 对于树脂球试样而言，加热和冷却程序为双循环试验，所述试验以将室平衡到_50°C而始，而后是以每分钟10°C的加热速度加热到200°C的第一加热时段，而后将试样于200°C平衡3分钟，而后是以每分钟10°C的冷却速度冷却到-50°C的第一冷却时段，而后将试样在-50°C平衡3分钟，然后是以每分钟10°C的加热速度加热至200°C的第二加热时段。 For the sample resin beads, the heating and cooling program is a two-cycle test, the test was the equilibrium chamber and the beginning to _50 ° C, and then heating rate is 10 ° C per minute to a first heated to 200 ° C a heating period, and after the sample equilibrated at 200 ° C 3 minutes, is followed by a cooling rate of 10 ° C per minute cooling period was cooled to -50 ° C first, and after the sample at -50 ° C 3 balance min, then the heating rate is 10 ° C per minute to 200 ° C to heat a second heating period. 对于纤维试样而言，加热和冷却程序为I周期试验，以将室平衡到-50°C而始，而后为以每分钟10°C的加热速度加热到200°C的加热时段，而后将试样于200°C平衡3分钟，而后为以每分钟10°C的冷却速度冷却到_50°C的冷却时段。 For fiber samples, the heating and cooling cycle test program is I to the equilibrium chamber to -50 ° C and the beginning, and then is heated to 200 ° C the heating period at a heating rate of 10 ° C per minute, and after balance sample was 200 ° C for 3 minutes, and then at a cooling rate of 10 ° C per minute to cool the cooling period of _50 ° C. 所有测试都在用55立方厘米每分钟的氮气(工业级）清洗测试室的条件下进行。 All tests were performed under the cleaning conditions of the test chamber with 55 cubic centimeters per minute nitrogen (industrial grade). 然后结果采用THERMAL ANALYST 2200 (version 8. 10)分析软件程序评价，该软件识别并量化曲折（inflection)的玻璃化转变温度，吸热和放热峰，以及DSC图中峰下方的面积。  and then using the result (version 8. 10) analysis software program evaluation THERMAL ANALYST 2200, the software identified and quantified the glass transition temperature of the meander (inflection), the area under the endothermic and exothermic peaks, and the peaks in FIG DSC . 玻璃化转变温度被认为是所述图的线中斜率发生明显变化的区域，熔融温度使用自动曲折计算测定。 The glass transition temperature is considered to be a line region in FIG significant change in slope, the melting temperature is calculated using the measured automatically turns. 测定DSC图上峰下方的面积，单位为焦耳每克试样（J/g)。 Measuring the area under the peaks on the DSC chart, in joules per gram of sample (J / g). 例如，树脂或纤维试样的熔合热通过积分吸热峰面积测定。 For example, a resin or a heat fusion fiber sample was determined by integration of the endothermic peak area. 面积数值通过将DSC图下方的面积（例如吸热面积）采用计算机软件转换为焦耳每克（J/g)单位以测定。 Value area by area (e.g. endothermic area) under the DSC plot using computer software converted to joules per gram (J / g) measured in units. 单个纤维试样被仔细地从纤维纤网未黏合的部分中、以不显著地牵拉纤维的方式取出。  Single fiber samples were carefully from the unbonded fibrous web section, taken in a manner that does not significantly pull the fiber. 这些纤维试样被缩短（例如用剪刀剪）到长度为38毫米，并分别置于黑色天鹅绒布上。 These fiber specimens were shortened (e.g. cut with scissors) to a length of 38 mm, and were placed on a black velvet cloth. 用这种方式收集10到15个纤维试样。 Collected fiber samples 10 to 15 in this way. 然后所述纤维试样基本上直地置于外尺寸为51mmX51mm,内尺寸为25mmX25mm的矩形纸框上。 The fiber sample was then placed on a substantially straight outer dimension of the rectangular paper frame 51mmX51mm, the size of 25mmX25mm. 通过仔细地将纤维端部用胶带固定到框边，每个纤维试样的端部被操作性地连接到所述框。 By carefully the fiber end portion is fixed to the rim with a tape, the ends of each fiber specimen were operatively attached to the frame. 随后使用常规实验室显微镜测量每一纤维试样外部相对较短的、横穿纤维方向的尺寸，所述显微镜经适当校准并设为40X放大率。 Then using conventional laboratory microscope measured relatively short outer each fiber sample, dimension in the direction transverse to the fiber, and the microscope properly calibrated to 40X magnification. 该横穿纤维尺寸记录为该单个纤维试样的直径。 The dimension across the fiber diameter of a single record for the fiber sample. 所述框协助将纤维试样的端部以避免对纤维试样造成过多损害的方式置于恒速拉伸型拉伸测试器的上下夹中。 The ends of the fibers to assist in block specimen to avoid excessive damage to the fiber sample mode is set constant rate extension type tensile tester in the vertical folder. 韧性值以克力每旦表示。  toughness value expressed as grams per denier. 脂肪族-芳香族共聚多酯树脂最初以商品名为ECOFLEX ® F BX 7011获自BASF。  aliphatic - aromatic copolyester resin initially under the trade name ECOFLEX ® F BX 7011 available from BASF. 该共聚多酯树脂通过与反应物溶液熔体混合改性。 The copolyester resin is modified by mixing the reaction solution with the melt. 对于实施例I和4而言（见表I)，该反应物溶液含有89被％的I，4-丁二醇及IIwt%的丙酮。 For the purposes of Examples I and embodiment 4 (see Table I), the reaction solution was containing 89% of I, 4- butanediol and IIwt% acetone. 对实施例2，3，5和6而言（见表I)，所述反应物溶液包含87wt %的I，4- 丁二醇，I Iwt %的丙酮，及2wt %的二乙酸二丁锡（催化剂）。 Example 3, 5 and 6 concerned (see Table the I), the reactant solution containing 87wt% of I, 4- butylene glycol, acetone I Iwt%, 2wt% and dibutyltin diacetate (catalyst). 该溶液通过Eldex泵进料到位于共旋转双螺杆挤出机（USALAB Prism H16，直径：16mm, L/D of 40/1)桶#4 的液体注射口，所述挤出机由Thermo ElectronCorporation 生产。 The solution was co-rotating twin-screw extruder fed by a pump located Eldex (USALAB Prism H16, diameter: 16mm, L / D of 40/1) barrel # 4 of the liquid injection port, the extruder manufactured by Thermo ElectronCorporation . 所述树脂在桶#1注入双螺杆挤出机。 The resin is injected into the tub 1 # twin screw extruder. 螺杆长度为25英寸。 Screw length of 25 inches. 挤出机具有一个直径为3毫米的模头开口。 Extruder having a diameter of 3 mm die opening. 在形成时，挤出的树脂在风冷传送带上冷却，通过Conair造粒机形成小球。 Upon formation, the extruded resin is cooled on a cooling belt, formed into pellets by a Conair pelletizer. 反应挤出参数在USALAB Prism H16挤出机上、在反应挤出过程中被监控。 Reactive extrusion parameters on USALAB Prism H16 extruder, the reaction is monitored in the extrusion process. 所述条件示于表I。 The conditions are shown in Table I. 研究未改性的ECOFLEX ® F BX 7011及试样1-6 (用I，4_ 丁二醇改性）的熔融流变学性能。  Research unmodified ECOFLEX ® F BX 7011 and Samples 1-6 (with I, 4_ glycol modified) melt rheological properties. 测量在170°C下,使用30/1 (长度/直径）mm/mm的模具,在G6ettfert Rheograph2003上进行（可获得于G0ettfert of Rock Hill, SC)。 Measured at 170 ° C, using 30/1 (length / diameter) mm / mm die, for (obtained in G0ettfert of Rock Hill, SC) on G6ettfert Rheograph2003. 在表观剪切速率为100，200，500，1000，2000及δΟΟΟίΓ1下测定表观熔融粘度。 100,200,500,1000,2000 the apparent shear rate and measuring the apparent melt viscosity at δΟΟΟίΓ1. 将在不同表观剪切速率下的表观熔融粘度作图并得到示于图2的流变曲线。 The apparent melt viscosity at different apparent shear rate was plotted and rheological profile obtained is shown in FIG. 2. 如图所示，对照试样（未改性的ECOFLEX®:树脂）的表观粘度远高于试样1-6的表观粘度。 As shown, the control sample (unmodified ECOFLEX®: resin) is much higher than the apparent viscosity of the apparent viscosity of the sample 1-6. 试样的熔体流动指数也使用Tinius Olsen挤出塑性计测定（170°C，2. 16kg)。 The melt flow index of the sample using the Tinius Olsen also measured plastic extrusion (170 ° C, 2. 16kg). 进一步地，试样通过GPC在以窄MW分布聚苯乙烯为标准下，进行分子量（Mw)分析。 Further, the sample is a narrow MW distribution polystyrene standards, molecular weight (Mw) was analyzed by GPC. 结果列于表2。 The results are shown in Table 2. 如其所示，改性树脂（试样1-6)的熔体流动指数明显大于对照样。  As shown, a melt flow index of the modified resin (Sample 1-6) was significantly greater than control sample. 此外，重均分子质量（Mw)和数均分子质量（Mn)以受控的形式降低，这确定了熔体流动指数的上升是由于与丁二醇的醇解。 Further, a weight-average molecular weight (Mw) and number average molecular weight (Mn) reduction in a controlled fashion, which determine the increase in melt flow index alcoholysis due butanediol. 产生的改性脂肪族-芳香族共聚多酯具有羟丁基末端基团。 Resulting modified aliphatic - aromatic copolyester has a terminal hydroxybutyl group. 一元醇对ECOFLEX ® F BX 7011的改性以I- 丁醇，2_丙醇以及2_乙氧基-乙醇为实例而被展示。  Modification of a monohydric alcohol ECOFLEX ® F BX 7011 to I- butanol, propanol, and 2_ 2_ ethoxy - ethanol example and is shown. 试验设置与实施例I中描述的相同。 The same experimental setup described in Example I. 过程条件示于表3。 Process conditions are shown in Table 3. 二乙酸二丁锡为所使用的催化剂。 Dibutyltin diacetate catalyst was used. 如表3所示，随着一元醇进料到挤出机，力矩减少。 As shown in Table 3, with the monohydric alcohol fed into the extruder, to reduce the torque. 随着一元醇和催化剂均进料到挤出机，力矩进一步减少。 As the monohydric alcohols and the catalyst were fed into the extruder, to further reduce the torque. 如其所示，试样7-12在整个剪切速率范围上具有比对照试样低的表观粘度及分子量。  As shown, the sample than the control sample 7-12 has a low apparent viscosity and molecular weight over the entire range of shear rates. 得到的改性共聚多酯与未改性共聚多酯在组成上不同，具有烷基末端集团。 Modified copolyester obtained with the unmodified copolyester different in composition, having a terminal alkyl group. 使用丙氧基钛(“Ti-P”），丁氧基钛(“Ti-B”）以及异丙氧基钛(“Ti-IsoP”）催化剂，如实施例I的描述，用I，4- 丁二醇对ECOFLEX ® FBX 7011进行改性。  Using propoxy titanium ( "Ti-P"), butoxy titanium ( "Ti-B") and titanium isopropoxide ( "Ti-IsoP") catalysts, as described in Example I, with I, 4- butanediol ECOFLEX ® FBX 7011 to be modified. 在反应挤出的过程中，挤出机的力矩在只有1，4_ 丁二醇加入时适度减少，并且随着钛催化剂的加入进一步减少。 In the course of the reaction in the extruder, the extruder torque in only a modest reduction 1,4_-butanediol was added, and further reduced with the addition of the titanium catalyst. 过程条件示于表5中。 Process conditions are shown in Table 5 below. 得到的改性共聚多酯具有羟丁基末端基团。 Resulting modified copolyester having a terminal hydroxybutyl group. 按照实施例I的描述测定每个试样的表观粘度及分子量。  Determination of apparent viscosity and molecular weight of each sample according to Example I are described. 该结果示于图3和表6中。 The results are shown in Table 6 and FIG. 如图3所示，试样16的粘度（丙氧基钛催化剂）在剪切速率的全范围内明显低于试样14(无催化剂）。  As shown in FIG. 3, the viscosity (propoxy titanium catalyst) of the sample 16 over the full range of shear rates significantly lower than the sample 14 (without a catalyst). 此外,试样13-20的分子量低于对照试样。 The molecular weight of the sample than the control samples 13-20. 脂肪族-芳香族共聚多酯树脂获自于BASF，商品名为ECOFLEX® FBX 7011。  aliphatic - aromatic copolyester resin in available from BASF, under the trade name ECOFLEX® FBX 7011. 制备含有87. 5wt%的1，4-丁二醇，7. 5wt%的乙醇及5wt %的丁氧基钛的反应物溶液。 87. Preparation containing 5wt% of 1,4-butanediol, 7. 5wt% ethanol and 5wt% of the reaction product of titanium butoxide solution. 使用Ramsey, NJ的Werner and Pfleiderer Corporation生产的共旋转双螺杆挤出机(ZSK-30，直径30毫米）。 Use Ramsey, NJ the Werner and Pfleiderer Corporation produced a co-rotating twin-screw extruder (ZSK-30, 30 mm in diameter). 螺杆长度为1328毫米。 Screw length of 1328 mm. 挤出机具有14个桶，从加料斗到模头连续编号为1-14。 Extruder having 14 barrels, from the hopper to the die numbered consecutively 1-14. 第一桶(#1)通过定容加料器以30磅每小时的处理量接收ECOFLEX® FBX 7011树脂。 A first barrel (# 1) receives ECOFLEX® FBX 7011 resin 30 lbs processing amount per hour by the volumetric feeder. 第五桶(#5)通过连接有Eldex pump的加压注射器分别在O到Iwt% ^ 1，4-丁二醇以及O到700份每百万份（“ppm”）的丙氧基钛的最终速率下接收反应物溶液。 A fifth barrel (# 5), respectively, are connected to O by pressing the syringe into the Eldex pump Iwt% ^ 1,4- butanediol, and O to 700 parts per million ( "ppm") propoxy titanium receiving the reaction solution at a final rate. 螺杆速度为150转每分钟（“rpm”）。 The screw speed was 150 revolutions per minute ( "rpm"). 用于挤出树脂的模头具有分开3毫米的四个模头开口（直径6毫米）。 A die for extruding a resin of 3 mm having four separate die openings (6 mm diameter). 在形成时,挤出的树脂在风冷传送带上冷却并由Conair造粒机形成小球。 Upon formation, the extruded resin is cooled on the conveyor belt by air Conair pelletizer formed into pellets. 在反应挤出过程中监控反应挤出参数。 Monitoring the reaction in the reaction extrusion process extrusion parameters. 条件示于下表7中。 Conditions are shown in Table 7 below. 如其所示，尽管模头压强确实从300下降到130磅每平方英寸（“psi”），单独加入的lwt%的丁二醇（试样21)不能明显降低对照样的力矩。 As shown therein , although die pressures indeed dropped from 300 to 130 lbs per square inch ( "psi"), separately added lwt% butanediol (Sample 21) does not significantly reduce the torque on the still. 加入lwt%的1，4_ 丁二醇和700ppm的丙氧基钛（实施例23)时，力矩和模头压强均明显分别降低到66-72%及30psi。 When added LWT% of butylene glycol and propoxylated 1,4_ 700ppm of titanium (Example 23), the die pressure and torque were significantly reduced to 66-72% and 30psi. 可通过改变反应物及催化剂，按比例调节力矩及模头压强。 By varying the reactants and the catalyst, and the scaled torque adjusting die pressure. 熔融流变试验也使用对照试样及试样21-23，在G6ettfert Rheograph2003 (可获得于G0ettfert in Rock Hill, SC)上，在180°C和190°C下，使用30/1 (长度/ 直径）mm/mm的模头进行。  melt rheological test sample and the control sample used also 21-23, in G6ettfert Rheograph2003 (obtained in G0ettfert in Rock Hill, SC) on, and at 180 ° C for 190 ° C, using 30/1 ( length / diameter) mm / mm die head. 在表观剪切速率为100，200，500，1000，2000及4000s—1下测定表观熔融粘度。 In 100,200,500,1000,2000 apparent shear rate of 4000s-1 and the apparent melt viscosity was measured. 结果示于图4。 The results are shown in FIG. 如其所示，试样21-23在整个剪切速率范围内具有远低与对照试样的表观粘度。 As shown, samples 21-23 having a much lower apparent viscosity and the control sample over the entire range of shear rates. 试样的熔体流动指数使用Tinius Olsen的挤出塑性计在190°C，2. 16kg下，通过ASTMD1239方法测定。 Melt flow index of a sample using a Tinius Olsen extrusion plastometer at 190 ° C, 2. Under 16kg, measured by the method ASTMD1239. 进一步地，试样通过GPC在以窄Mw分布聚苯乙烯为标准下，进行分子量(MW)分析。 Further, the sample is a narrow Mw distribution polystyrene standards, molecular weight (MW) was analyzed by GPC. 结果列于表8。 The results are shown in Table 8. 如其所示，改性树脂的熔体流动指数（试样21-23)明显大于对照试样。  As shown, a melt flow index of the modified resin (Sample 21-23) significantly greater than the control sample. 此外，重均分子质量（Mw)和数均分子质量（Mn)以受控的方式降低，这确认了熔体流动指数的增加是由于与催化的丁二醇的醇解。 Further, a weight-average molecular weight (Mw) and number average molecular weight (Mn) decreases in a controlled manner, confirming an increase in melt flow index is the result of alcoholysis catalyzed glycol. 下述表9也列出了对照试样及试样21-23的DSC分析数据。 Table 9 also shows the DSC analysis of the control sample and the sample data 21-23. 如其所示，试样22和23 (以1，4- 丁二醇改性）的Tg及Tm与对照试样比较，基本没有变化。  As shown, samples 22 and 23 and Comparison (1,4-butanediol, modified) Tg Tm and the control sample, substantially no change. 如实施例4所描述,使用ZSK-30挤出机来制备不同的试样（试样24_28)。  As described in Example 4 to prepare different samples (Sample 24_28) using the ZSK-30 extruder embodiment. 对于试样24而言，在总处理量为20磅每小时的情况下，第一桶(#1)经由定容加料器接收90wt%的ECOFLEX® F BX 7011树脂并且第七桶（#7)经由侧加料器接收10wt%的氮化硼。 For sample 24, the total processing amount of 20 pounds per hour, the first cylinder (# 1) receives 90wt% of ECOFLEX® F BX 7011 resin via a volumetric feeder and the seventh barrel (# 7) 10wt% of boron nitride received via a side feeder. 对于试样25而言，在总处理量为20磅每小时的情况下，第一桶（#1)通过两个定容加料器接收8(^七％的ECOFLEX:® F BX 7011树脂及20%的EnPol ®聚琥珀酸丁二酯G-4500。对于试样26而言，在总处理量为30磅每小时的情况下，第一桶(#1)经由两个定容加料器接收90wt %的ECOFLEX ® F BX 7011树脂及IOwt %的ENMAT ®聚羟基丁酸酯-共-戊酸酯。对于试样27而言，在总处理量为20磅每小时的情况下，第一桶（#1)经由两个定容加料器接收85wt%的EC0FLEX®F BX 7011树脂及IOwt %的Biomer ®聚羟基丁酸酯P-226，第七桶(#7)经由侧加料器接收5% (w/w)的氮化硼。最后，对于试样28而言，第一桶(#1)经由两个定容加料器接收90wt%的ECOFLEX ® F BX7011树脂及IOwt %的试样27，总处理量为301b/h，第五桶(#5)经由连接有Eldex泵的加压注射器接收反应物溶液，最终速率分别为0.5»1:%的1,4-丁二醇及350份每一百万份（ppm)的丁氧基钛。 For sample 25, the total processing amount of 20 pounds per hour, the first cylinder (# 1) receives 8 (^ seven percent of ECOFLEX by two volumetric feeder: ® F BX 7011 resin and 20 % in the case of polybutylene succinate EnPol ® G-4500. for the sample 26, in a total amount of 30 pounds per hour process, the first barrel (# 1) received via two 90wt volumetric feeder % of ECOFLEX ® F BX 7011 resin and IOwt% of ENMAT ® polyhydroxybutyrate - co - valerate case for sample 27, in the total treatment capacity of 20 pounds per hour, a first tub ( # 1) received via two 85wt% volumetric feeder EC0FLEX®F BX 7011 resin and IOwt% of polyhydroxybutyrate Biomer ® P-226, a seventh barrel (# 7) received 5% (via a side feeder w / w) of boron nitride. Finally, for sample 28, the first cylinder (# 1) receives 90wt% of ECOFLEX ® F BX7011 IOwt% resin and 27 via two sample volumetric feeder, total treatment an amount of 301b / h, the fifth barrel (# 5) receiving the reaction solution via a syringe connected to a pressurized Eldex pump, the final rate of 0.5 »1:% of 1,4-butanediol and 350 parts per million parts (ppm) of titanium butoxide. 用于挤出树脂的模头具有四个分隔3毫米的模头开口（直径6毫米）。  A resin extrusion die having four spaced die openings of 3 mm (6 mm diameter). 在形成时，挤出的树脂在风冷传送带上冷却并由Conair造粒器形成小球。 Upon formation, the extruded resin is cooled on the conveyor belt by air Conair pelletizer formed into pellets. 反应挤出参数经监控并记录。 The reaction monitored and recorded by the extrusion parameters. 条件示于下文表10中。 Conditions are shown in Table 10 below. 如实施例I所述，使用USALAB Prism H16挤出机制备不同的试样（试样29-32)以衡量其纤维纺织性能。  As in Example I, using an extruder apparatus USALAB Prism H16 different samples (samples 29-32) to measure their performance fiber textile. 对于试样29而言，ECOFLEX ® F BX7011树脂在桶#1处进料到挤出机，并将2. 7被％的1，4_ 丁二醇和700ppm的丁氧基钛（TP)的反应物溶液通过Eldex泵、经由位于桶#4处的液体注射口注射入挤出机，总处理量为3磅每小时。 For purposes of the specimen 29, ECOFLEX ® F BX7011 resin fed into the extruder at barrel # 1 and 2.7% of the 1,4_ butanediol and 700ppm of titanium butoxide (TP) reactant by Eldex pump was injected into the extruder barrel through # 4 is located at the liquid injection port, a total processing volume of 3 pounds per hour. 对于试样30而言，ECOFLEX ® F BX 7011树脂在桶#1处进料到挤出机，并将2. 7wt%的I- 丁醇和700ppm的二乙酸二丁二醇脂（dibutylene diacetate) (DBDA)的反应物溶液通过Eldex泵、经由位于桶#4处的液体注射口注射入挤出机，总处理量为3磅每小时。 For purposes of the specimen 30, ECOFLEX ® F BX 7011 resin fed into the extruder at barrel # 1, and 2. 7wt% of I- butanol and 700ppm aliphatic glycol diacetate (dibutylene diacetate) ( DBDA) Eldex reaction solution is passed through a pump, injected into the extruder barrel through # 4 is located in the liquid injection port, a total processing volume of 3 pounds per hour. 对于试样31而言，在桶#1处将90wt %的ECOFLEX ® F BX 7011和IOwt %的试样24的干混合物进料到挤出机中，并将2. 7wt%的1，4- 丁二醇和700ppm的二乙酸二丁二醇脂（DBDA)的反应物溶液通过Eldex泵,经由位于桶#4处的液体注射口注射入挤出机，总处理量为3磅每小时。 For sample 31, in the barrel of # 1 to 90wt% ECOFLEX ® F BX 7011 IOwt dry mixture and 24% of the sample into an extruder, and 2. 7wt% 1,4 700ppm butanediol and aliphatic glycol diacetate (DBDA) Eldex reaction solution is passed through a pump, located in the tub # 4 via the liquid injection port of the injection into the extruder, processing a total amount of 3 pounds per hour. 对于试样32而言，在桶#1处将90wt %的ECOFLEX ；® F BX 7011和IOwt %的试样26的干混合物进料到挤出机中，并将含2. 7«七％的1，4_ 丁二醇和700ppm的二乙酸二丁二醇脂（DBDA)的反应物溶液通过Eldex泵、经由位于桶#4处的液体注射口注射入挤出机，总处理量为3磅每小时。 For sample 32, in the barrel of the # 1 90wt% of ECOFLEX; ® F BX 7011 dry mix sample IOwt% and 26 into an extruder, and containing 2.7 «seven percent of 1,4_ 700ppm butanediol and aliphatic glycol diacetate (DBDA) of the reactant solution through Eldex pump, injected into the extruder barrel through # 4 located at the liquid injection port, a total processing volume of 3 pounds per hour . 挤出机参数经监控并记录。 Extruder parameters was monitored and recorded. 条件示于下表11。 Conditions are shown in Table 11. 纤维纺织是通过pilot Davis标准纤维纺织生产线完成的，所述生产线由两个挤出机、骤冷室和最大速度为3000米/分钟的导丝辊组成。  through the pilot Davis fiber textile standard fiber textile of the production line completes, the line consists of two extruders, quench chamber and a maximum speed of 3000 m / min godet rolls. 这些试样所使用的纺织模板为十六孔板，其每个孔的直径为O. 6_。 The samples used in the textile template is sixteen orifice, the diameter of each hole is O. 6_. 试样29-32在纤维纺织前于70°C下预先干燥。 Before the textile fiber samples 29-32 at 70 ° C for pre-dried. 未改性的Ecoflex® F BX 7011也于5rpm挤出机速度和150°C下纺织。 Unmodified Ecoflex® F BX 7011 also 5rpm extruder at 150 ° C and spinning speed. 挤出机压强迅速上升到3650psi以上并关闭。 Extruder pressure rose rapidly and to close more than 3650psi. 未收集到纤维。 Not collected fibers. 与20%PBS预混的未改性的Ecoflex®F BX 7011(试样25)也在挤出机速度5rpm，压强2500psi，温度160°C下纺织。 With 20% PBS premix unmodified Ecoflex®F BX 7011 (Sample 25) are extruder speed 5rpm, pressure 2500psi, textile at a temperature of 160 ° C. 纤维在断裂前只能拉伸至200m/min。 Fibers can only be stretched before breaking to 200m / min. 纤维试样在MTS Synergie 200拉伸测试器进行分析。 Fiber samples were analyzed MTS Synergie 200 tensile tester. 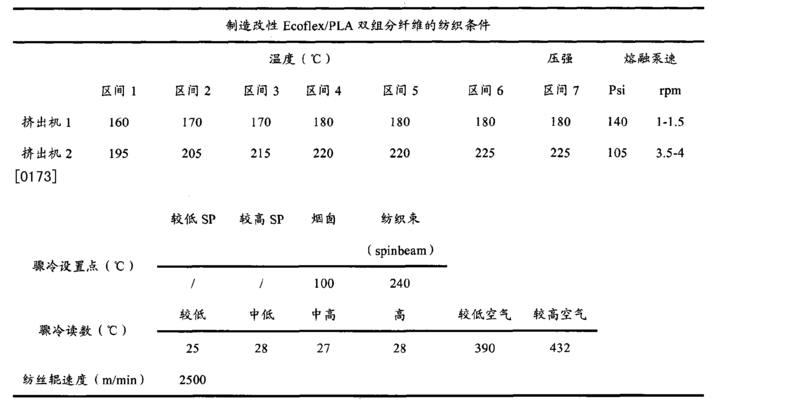 纤维纺织条件及获得的纤维性质示于表12。 Conditions and fiber properties of textile fibers obtained are shown in Table 12. 带有作为鞘的改性Ecoflex ®F BX 7011 (试样28)和作为核的NatureWorks PLA6201D的双组分纤维也使用实施例7中的纤维纺织生产线纺织。  As with the modified sheath Ecoflex ®F BX 7011 (sample 28) and a bicomponent fiber as core NatureWorks PLA6201D also used in Example 7 embodiment textile fiber textile production lines. 试样33和试样34产生的双组分纤维的鞘/核比分别为20/80和30/70。 Sheath bicomponent fiber sample 33 and sample 34 produced / core ratios of 20/80 and 30/70. 纤维纺织条件列于表13中。 Textile fibers in conditions shown in Table 13. 制得的纤维在MTS Synergie 200拉伸测试器上分析。  Analysis of the fibers obtained in the MTS Synergie 200 tensile tester. 其性质列于表14。 Its properties are shown in Table 14. 尽管已经关于具体实施方案对本发明进行了叙述，应该理解的是，本领域技术人员在理解现有技术的基础上，可以容易地构想出这些实施方案的改变，变化以及等同方案。  While the embodiment has been with respect to specific embodiments of the present invention has been described, it should be understood that those skilled in the art on the basis of understanding the prior art, can be readily devised by changing these embodiments, variations, and equivalents. 相应地，本发明的范围应被评估为所附权利要求及其任何等同体的范围。 Accordingly, the scope of the invention should be assessed as the scope of the appended claims and any equivalents thereof. 1. 一种制备生物可降解的、基本上连续的多组分纤丝的方法，所述方法包括： 制备含有熔点为150°c到250°C的第一种聚酯的第一热塑性组合物； 通过将前体脂肪族-芳香族共聚多酯与至少一种醇熔体混合，以使所述共聚多酯发生醇解反应以制备第二热塑性组合物，所述醇解反应产生由烷基基团、羟烷基基团、或其组合封端的改性共聚多酯，所述改性共聚多酯具有50°C到150°C的熔点，并且熔体流动指数高于前体共聚多酯的熔体流动指数，所述熔体流动指数在2160克负载及190°C温度下按照ASTM测试方法D1238-E测得；并且共挤出第一热塑性组合物及第二热塑性组合物以形成基本上连续的纤丝。 , Substantially continuous multicomponent filaments, the method for preparing a biodegradable comprising: preparing a melting point of 150 ° c to the first thermoplastic composition is a first polyester to 250 ° C ; precursor by aliphatic - aromatic copolyester mixed with a melt of at least one alcohol, such that the copolyester alcoholysis reaction occurs to produce a second thermoplastic composition, the alcoholysis reaction with alkyl groups, hydroxyalkyl groups, or combinations thereof terminated modified copolyester, said modified copolyester having a melting point of 50 ° C and to 150 ° C, and a melt flow index of the precursor copolyester is higher than melt index, the melt flow index D1238-E as measured in accordance with ASTM test method under 2160 g load and a temperature of 190 ° C; and co-extruding a first thermoplastic composition and the second thermoplastic composition to form substantially continuous filaments. 2.如权利要求I所述的生物可降解纤丝，其中所述改性共聚多酯具有10，000到70, 000克每摩尔的数均分子量，及20，000到125，000克每摩尔的重均分子量。 2. I claim the biodegradable filaments, wherein the modified copolyester having a 10,000 to 70,000 grams per mole number average molecular weight, and 20,000 to 125,000 grams per mole the weight average molecular weight. 3.如权利要求2所述的生物可降解纤丝，其中所述改性共聚多酯具有20，000到60, 000克每摩尔的数均分子量，及30，000到110，000克每摩尔的重均分子量。 3. Biological according to claim 2 biodegradable filaments, wherein the modified copolyester having a 20,000 to 60,000 grams per mole average molecular weight, and 30,000 to 110,000 grams per mole the weight average molecular weight. 4.如权利要求I所述的方法，其中所述改性共聚多酯的熔体流动指数与前体共聚多酯的熔体流动指数的比值至少为I. 5。 4. The method of claim I, wherein the modified copolyester has a melt flow index of the precursor copolyester melt flow index ratio of at least I. 5. 5.如权利要求I所述的方法，其中所述改性共聚多酯的熔体流动指数为5到200克每10分钟。 5. The method of claim I, wherein the modified copolyester has a melt flow index of from 5 to 200 grams per 10 minutes. 其中， m为2至IJ 10的整数； η为O至IJ 18的整数； P为2至IJ 10的整数； X为大于I的整数； y为大于I的整数；并且R1及R2为独立地选自氢；直链或分枝的，取代或未取代的C1-Cltl烷基基团；以及直链或分枝的，取代或未取代的C1-Cltl羟烷基基团，其中R1或民中的至少一个为直链或分枝的，取代或未取代的C1-Cltl烷基或C1-Cltl羟烷基基团。 Wherein, m is an integer of 2 to IJ 10 a; [eta] is an integer from O to IJ 18 a; P is an integer of 2 to IJ 10; X is greater than I is an integer; Y is greater than I the integers; and R1 and R2 are independently is selected from hydrogen; straight or branched, substituted or unsubstituted C1-Cltl alkyl group; and linear or branched, substituted or unsubstituted C1-Cltl hydroxyalkyl group, wherein R1 or civil at least one linear or branched, substituted or unsubstituted alkyl group or a C1-Cltl C1-Cltl hydroxyalkyl group. 7.如权利要求I所述的方法，其中所述前体共聚多酯为聚己二酸对苯二甲酸丁二酯。 7. The method according to claim I, body copolyester is polybutylene adipate terephthalate wherein the front. 8.如权利要求I所述的方法，其中所述改性共聚多酯具有0°C或更低的玻璃化转变温度。 8. The method of claim I, wherein the modified copolyester having a 0 ° C or a glass transition temperature lower. 9.如权利要求I所述的方法，其中所述熔体混合于50°C到300°C，及表观剪切速率为IOOs-1 到10，OOOs 1 下发生。 9. The method of claim I, wherein the melt mixed at 50 ° C and 300 ° C, and the apparent shear rate IOOs-1 to 10, OOOs 1 occurs next. 10.如权利要求I所述的方法，其中所述第一种聚酯为聚乳酸。 10. The method of claim I, wherein the first polyester is polylactic acid. 11.权利要求4所述的方法，其中所述改性共聚多酯的熔体流动指数与前体共聚多酯的熔体流动指数的比值至少为10。 11. The method according to claim 4, wherein the modified copolyester has a melt flow index of the precursor copolyester melt flow index ratio of at least 10. 12.权利要求5所述的方法，其中所述改性共聚多酯的熔体流动指数为15到50克每10分钟。 12. The method according to claim 5, wherein the modified copolyester has a melt flow index of 15 to 50 grams per 10 minutes. 13.权利要求6所述的方法，其中m为2至4的整数。 13. The method according to claim 6, wherein m is an integer of 2 to 4. 14.权利要求13所述的方法，其中m为4。 14. The method of claim 13, wherein m is 4. 15.权利要求6所述的方法，其中η为2至4的整数。 15. The method of claim 6, wherein η is an integer of 2 to 4. 16.权利要求15所述的方法，其中η为4。 16. The method of claim 15, wherein η is 4. 17.权利要求6所述的方法，其中P为2至4的整数。 The method of claim 6 wherein P is an integer of 2 to 4. 17. Claim. 18.权利要求17所述的方法，其中P为4。 18. The method according to claim 17, wherein P is 4. 19.权利要求9所述的方法，其中熔体混合于90°C到220°C，及表观剪切速率为8()0(1到1200(1下发生。 19. The method of claim 9, wherein the melt mixed at 90 ° C to 220 ° C, and the apparent shear rate is 8 () 0 (1 to 1200 (1 occurs next. 20. 一种形成无纺纤网的方法，所述方法包括将如权利要求I所述方法得到的纤丝随机堆积到形成面上。 20. A method of forming a nonwoven web, said method comprising the filaments obtained by the method I as claimed in claim randomly deposited to form a surface. 21. 一种通过上述权利要求中任一项所述的方法可获得的生物可降解、基本上连续的多组分纤丝，所述纤丝包括第一组分和第二组分，所述第一组分包含熔点为150°C到250°C的第一种聚酯，并且所述第二组分包含第二聚酯，其中所述第二聚酯为由烷基基团、羟烷基基团、或其组合封端的脂肪族-芳香族共聚多酯，所述脂肪族-芳香族共聚多酯具有5到200克每10分钟的熔体流动指数，所述熔体流动指数在2160克负载及190°C温度下按照ASTM测试方法D1238-E测得。 21. A method according to any one of the preceding claims obtainable by biodegradable, substantially continuous multicomponent filaments, said filaments comprising a first component and a second component, said a first component comprising a first polyester having a melting point to 150 ° C to 250 ° C, and said second component comprising a second polyester, wherein the second polyester by an alkyl group, a hydroxyalkyl group, or combinations thereof terminated aliphatic - aromatic copolyester, the aliphatic - aromatic copolyester having from 5 to 200 grams per 10 minutes melt flow index, the melt flow index 2160 D1238-E as measured in accordance with ASTM test method gram load and at a temperature of 190 ° C.
DE3781133D1 (en) 1986-12-19 1992-09-17 Akzo Nv Preparation of polylactic acid, and copolymers thereof. DE4200320A1 (en) 1992-01-09 1993-07-15 Bayer Ag New polyether-polycarbonate block copolymers - derived from 1,1-bis-(4-hydroxyphenyl)-cycloalkane(s) and polyether-glycol(s) by reaction with phosgene, etc. IT1256918B (en) 1992-08-04 1995-12-27 Mini Ricerca Scient Tecnolog Process for the production of poly lactic acid. ES2276193T3 (en) 1999-06-18 2007-06-16 Toray Industries, Inc. Polylactic acid resin, textile products obtained therefrom and processes for producing textiles.